The trailer listed hard to the side, the 44-inch tire deep into the crevasse, the Hilux’s frame broken, and a tire peeled from the bead. The Expeditions 7 team had just crossed Greenland and was now fighting for every mile in a minefield of cracks and fissures that littered the glacier. We had just towed our supply trailer over 3,000 miles, carrying critical fuel and supplies in support of the expedition. At times it carried over 8,000 pounds of Jet A-1 and equipment, and as a result, it suffered numerous failures—from broken bolts, fractured welds, and even the loss of a wheel, the offending tire speeding past the tow vehicle and coming to rest in the snow. Despite these challenges, we required a trailer to complete our journey, proving the value they can provide to the traveler when capacity and (often) comfort are desired. We can all see the appeal of a fully stocked trailer sitting in the garage, everything packed and organized, a faithful companion just waiting for Friday afternoon and a weekend of exploration. The benefits are clear, but there are over 40 different manufacturers and endless options to consider. What makes for the ultimate trailer? What performance attributes are critical and often overlooked? For this article, Expedition Portal’s Managing Editor Chris Cordes and I selected seven contenders for our comparison and put them all through their paces. Many modern overland vehicles suffer from abysmal payload, with some models reaching their limit carrying just a few adults, children, and a fridge filled with food on board. The only way to safely add payload is with a trailer, which shifts the total capacity from just gross vehicle weight (GVW) to gross combined vehicle weight rating (GCVWR). Put a family of four in a Jeep Wrangler 2-door, and all of the usable space is gone. The best way to add storage volume is with a small trailer that has a lot of usable space. Look for products that eschew systems and gadgets in favor of an open container. These are easy to tow and can give the same space as a truck bed to stow bags, supplies, and camping equipment. A trailer is better than an overloaded rack. Roof racks should be reserved for the lightest of loads, but unfortunately, it is the first place travelers tend to stash heavy, bulky items. In general, most vehicles have a roof load limit of 100-150 pounds, while most trailers can easily transport many times that (within the limits of the vehicle’s tow rating). This also brings the load lower, which makes everything easier to access. In our testing, we found the highway fuel mileage impact of a trailer to be nearly identical to that of a roof rack with boxes. 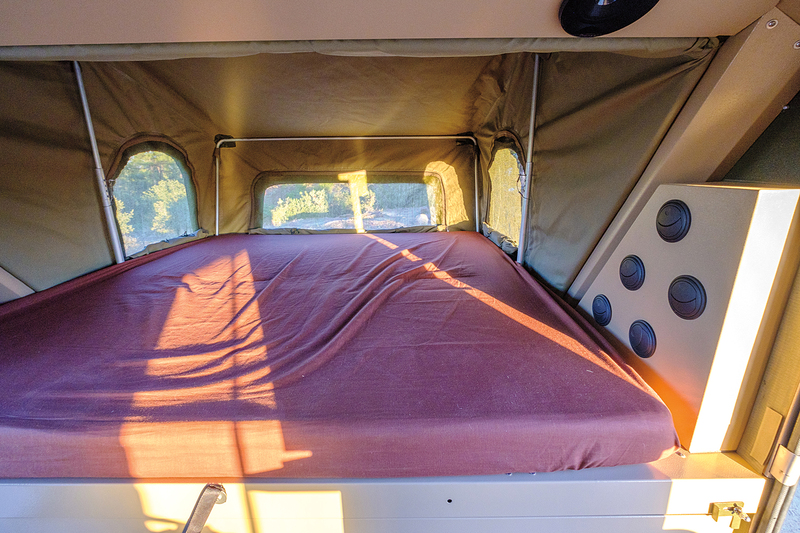 Teardrop-style trailers allow for sleeping inside a hard shell; they require no setup and will have the owners in a warm, weatherproof cocoon in a matter of seconds. No soggy tents to put away, no mattress to inflate, and no flapping fabric. These hard-wall units are quiet, comfortable, and ideal for extreme conditions. 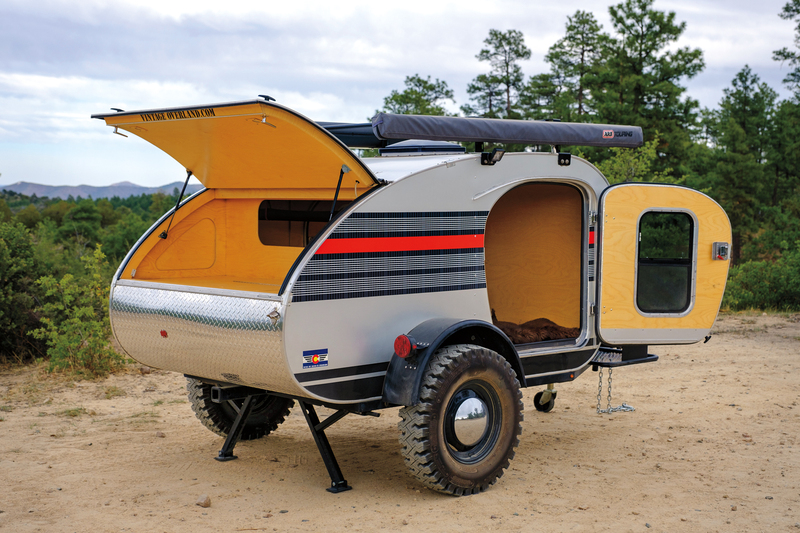 We all lead busy lives, so the idea of having a full stocked bug-out trailer has universal appeal. It can be parked in the garage with all of the gear properly organized and ready for service. Even late on a Friday night, the unit can be easily connected, and after a stop at the store to stock food and drinks, it is off to the campsite. 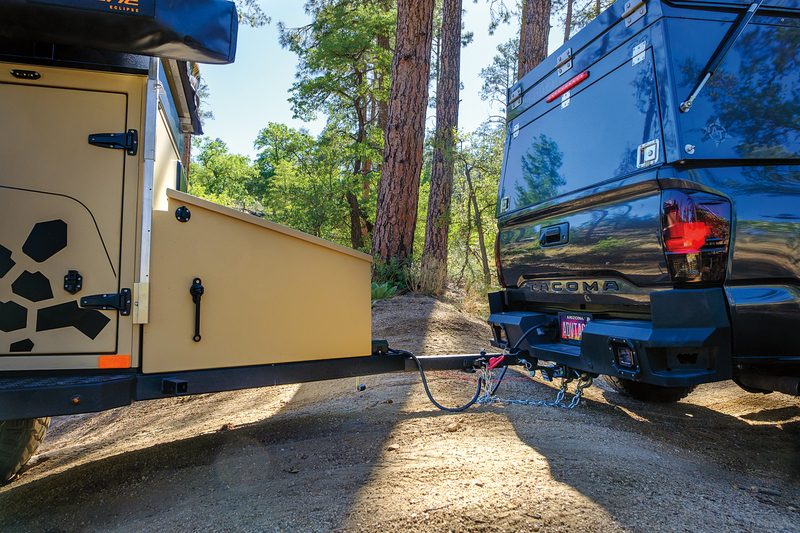 This eliminates all of the packing and organizing required with a daily driver and also helps reduce the number of camping-specific modifications that have to be done to the tow vehicle. It’s also a perfect solution for leased SUVs or vehicles that serve multiple roles in the family. 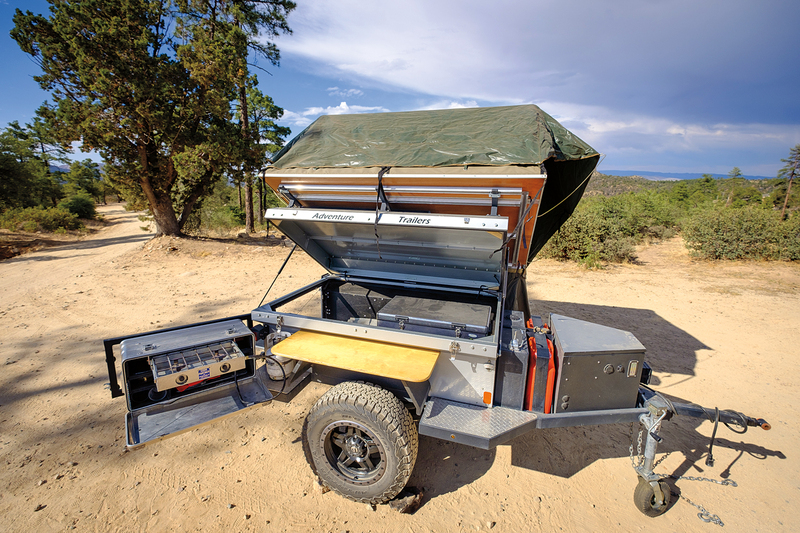 For those who love to camp in one spot for a few days or a week, disconnecting the trailer and leaving it fully assembled is a compelling advantage. Many models allow for elaborate accommodations, with full-radius awnings, large kitchens, and expansive rooms. These take time to set up but can be a welcome respite after a long day of hiking or four-wheeling. One of the most important considerations is configuration—buying a unit that best meets the needs of the traveler and their travel mates. All too often, trailers are purchased for reasons that are not critical, such as a small off-pavement trailer being pulled by a full-size truck, creating a mismatch in performance and track width, without providing amenities that cannot be easily incorporated into the tow vehicle. If comfort is the goal, buy the trailer that makes it the easiest to get a sound night’s sleep and reprieve from the weather. If plans include crossing the Rubicon, then there are only a few options that can survive such an undertaking. Start with a list of wants and then find a trailer that meets those first: looks and gadgets can come in a distant second. Performance begins with the suspension, which can easily make a trailer amazing, or an utter disaster once the going gets rough. Based on our experience and testing, a torsion style axle will not only abuse the trailer but will destroy the contents when used off-highway. 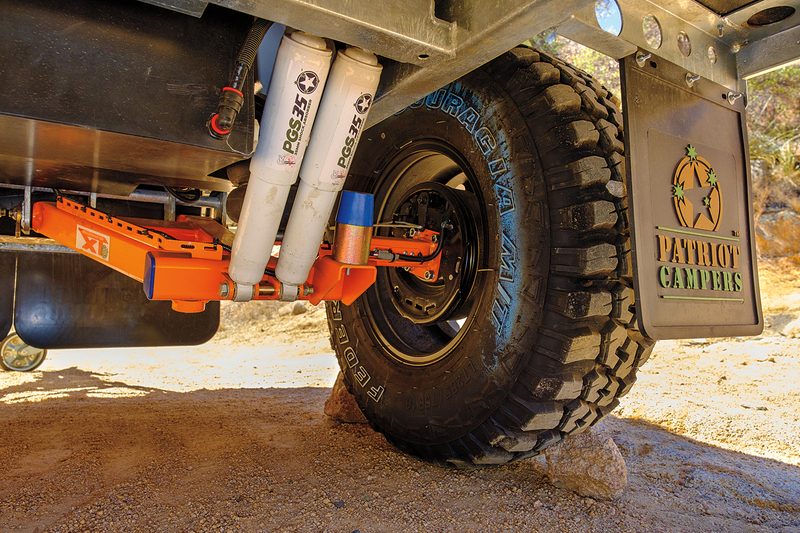 The systems that work best will have suspension travel within 70 percent of the tow vehicle’s travel; otherwise, the driver will move at a comfortable pace for the 4WD, but it will turn the trailer into an expensive blender with broken bottles, shredded clothing, and shattered boxes being the result. 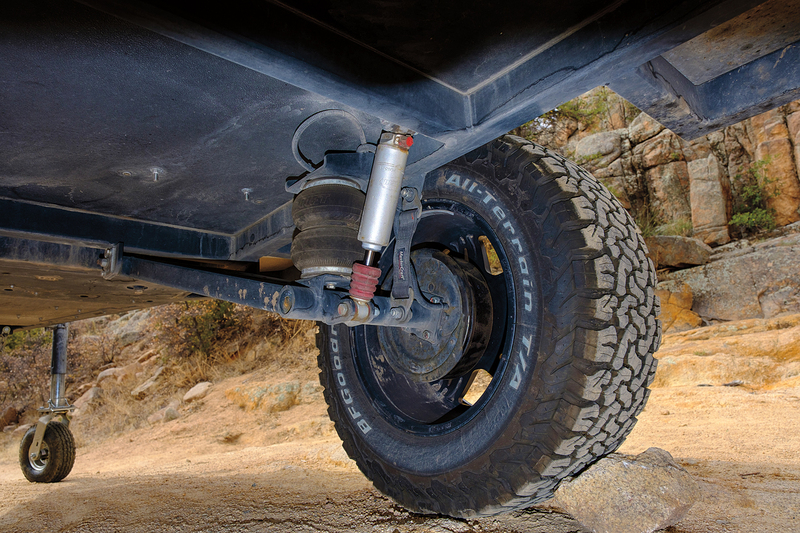 At a minimum, the suspension should be like the Timbren Axle-Less units with longer travel and damping that occurs on compression and extension. 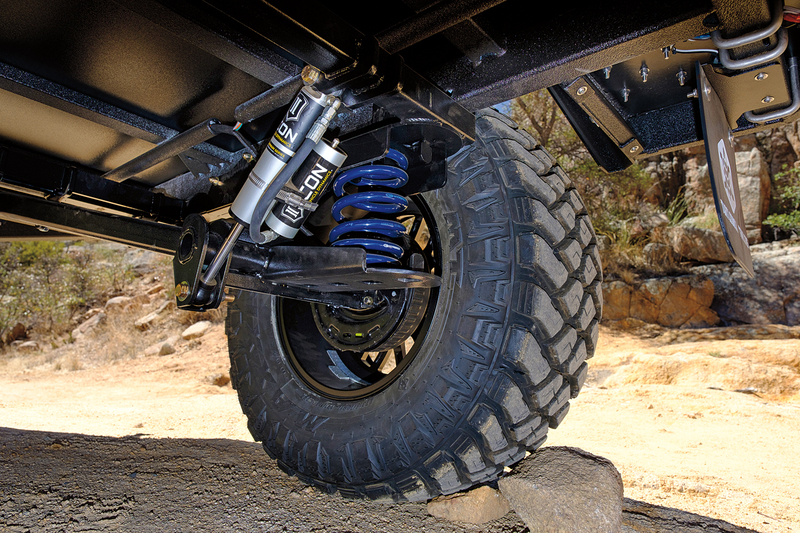 Ideally, the suspension will be long travel and independent, with shocks to properly control rebound and compression. It is also crucial that the track width of the trailer closely matches that of the tow vehicle, or sand, mud, and ruts will all become more challenging with increased resistance and reduced control. Lastly, the distance from the axle of the trailer to the coupler should be approximately the same length (or slightly shorter) as the tow vehicle’s wheelbase to ensure that the turning radius and maneuverability is maintained, particularly on tight trails. 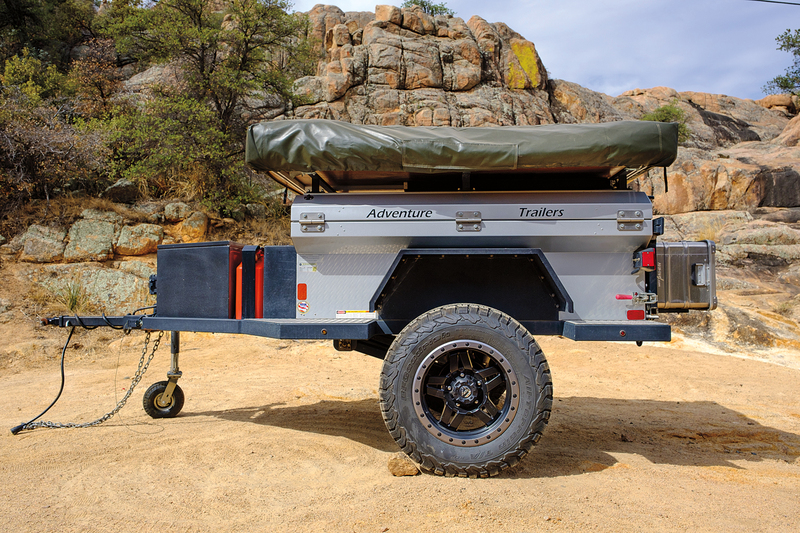 As with all equipment we use for adventure travel, reliability and durability are paramount, and trailers are no exception. I have experienced trailer failures far more often on trips than not, seeing everything from wheels tearing off to rollovers. Durability comes from the quality of the materials used and the way the unit was designed. Some manufacturers rely on finite element analysis and advanced tools, while others wing it. Reliability is a reflection of attention to detail with wiring and other systems and the quality of assembly. 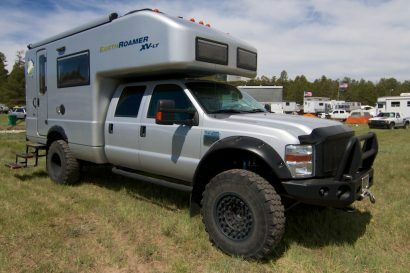 Buy from manufacturers with a favorable reputation in the industry and talk with other owners on various overland forums and at events such as Overland Expo. We used a 2017 Toyota Tacoma to pull each of the samples, a decent indicator of towing performance behind most modern V6 platforms. We also conducted some longer remote travel tests behind our project G-Wagen, which allowed the opportunity to spend quality time with a few of the products we were less familiar with. Chris Cordes and I were the two evaluators. Both of us have extensive time dragging trailers through unusual conditions, including me crossing Greenland, and both of us on trips to the Arctic. Chris has owned a military-style cargo trailer, a teardrop, and currently, a 27-foot Airstream that he lives out of full time. I have owned a total of five camping trailers, the first dating back to 1999 and a Venturecraft (a brilliant, but now discontinued model). We have both developed a love-hate relationship with trailers, making us particularly critical testers. The testing process included a full inspection of the trailer and systems, followed by an initial trail test and photo shoot. Next came an on-pavement test loop that was complete with city driving, twisty roads, highways, and steep grades. This allowed us to consider highway speeds and maneuverability in traffic. For the trail, we used part of our long-standing test loop, a route that provides technical cross-axle ruts and erosion, aggressive approach and departure obstacles, and tight tolerances between trees. Here we measured traction control intervention and ease of towing through the deep gullies. 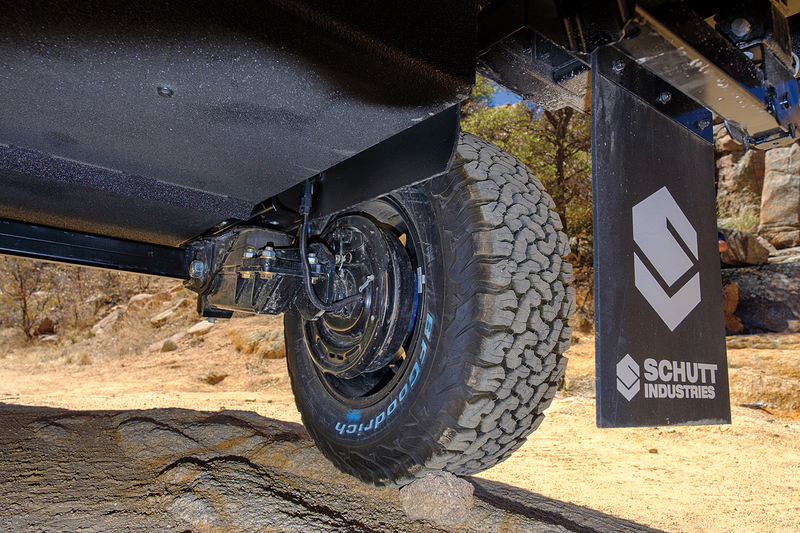 We purposefully hit rocks and tree stumps with the trailer tires to evaluate suspension dynamics. And, we modulated the brakes to determine braking capacity and the ability of the driver to lock the trailer tires to allow for more advanced towing maneuvers. The last route included highspeed dirt roads with corrugation, washouts, embedded rock, and decomposed granite. This segment ended at a beautiful campsite that allowed us to time setup and compare camping comfort and support systems overnight. The evaluation was constructed to be primarily empirical, with a group of criteria that included everything from measured curb weight to exact camp set-up times. Subjective considerations were related mainly to comfort and towing performance, but even those were as controlled as possible, with the same path used through technical terrain and the same road used for the pavement portion. Fortunately, the strengths and weaknesses were readily apparent and cross-validated by Chris and me. This is not to infer that all bias is removed since we both have preferences in type and important qualities, reflected in our conclusions. Both of us completed each review with Chris focusing on the camping attributes, and me writing the introduction and overland sections. 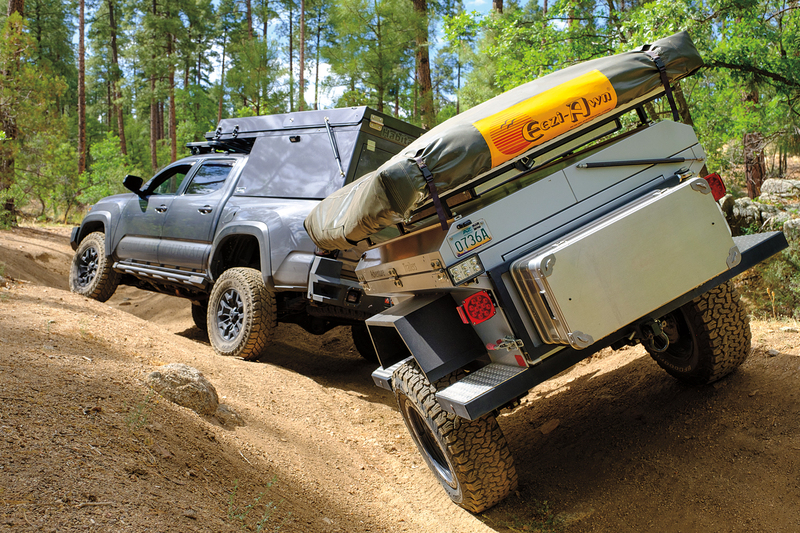 I first met Mario and Martyn from Adventure Trailers over 14 years ago during a friendly meeting at SEMA to talk about adventure and the overland trailer market—the latter still in its infancy. Both had lived in Africa and traveled the world extensively, and both had a new idea to share: the AT Overland Chaser. From that initial meeting, I ordered a trailer that would ultimately travel with me all the way to the Arctic Ocean in 2007. Chasers have been pulled across the Rubicon Trail and even over the Road of Bones. With simplicity and performance as its cornerstone, the Chaser is rarified in its singularity of purpose: to haul equipment over the most unforgiving terrain imaginable. 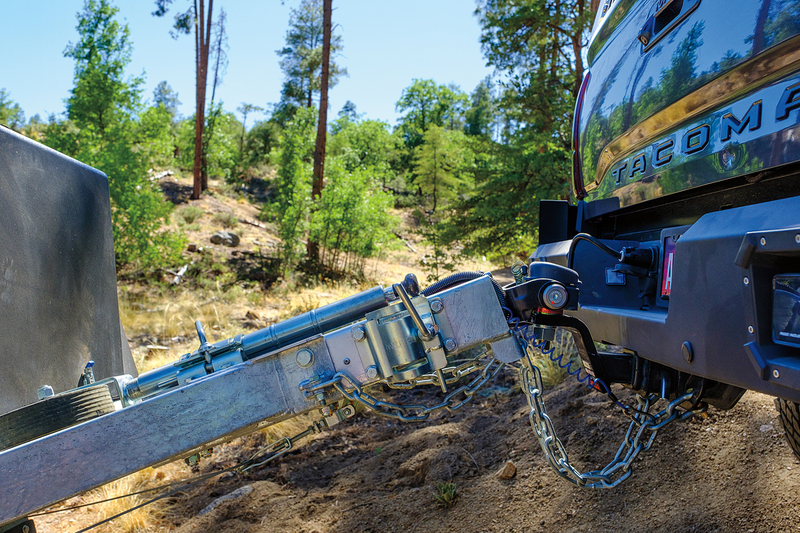 Towing the Chaser can best be described as easy, the lightweight and compact dimensions allow it to follow the vehicle over even the most extreme terrain. There was none of the typical noise or burden that comes from heavier offerings. The Max Coupler is essentially silent. With the overall package tucking entirely behind the Tacoma it also imparts minimal wind drag. The soft suspension that excels on the trail does transmit more body roll than some—noticeable during rapid lane change tests and in quick transitions on twisty mountain roads. 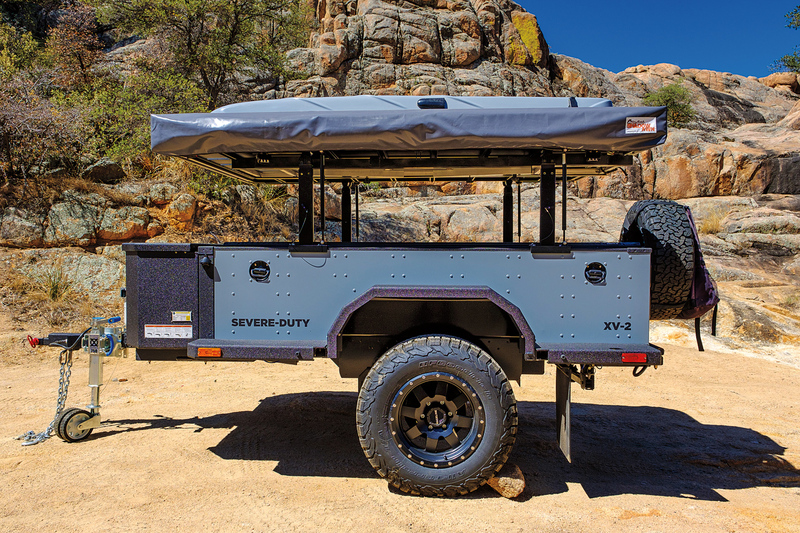 As we had the trailer configured, it was more than acceptable, but it would be a critical lesson for buyers that wanted to install heavy roof tents or weighty accessories to the Chaser’s optional rack. On the trail, the Chaser behaved dutifully, tracking behind the Toyota through the cross-axle challenges, over logs, extreme side slopes and every variant of approach and departure obstacle. It was easily the most capable of the tested trailers on technical routes, a combination of excellent ground clearance, low overall weight, and small footprint. The narrow track helps in dry, hard terrain, but would prove to be a limitation in snow, sand, or mud. The Chaser is not as plush as some of the other independent suspension units, the firmer factory airbag setting and limit straps helping with sway, but affecting total active compression and extension travel on higher-speed mixed surfaces. Overall, the Chaser is highly competent, and with the airbag and independent suspension, it does a good job of allowing for a wide range of loads, while still isolating the most fragile contents from abuse. 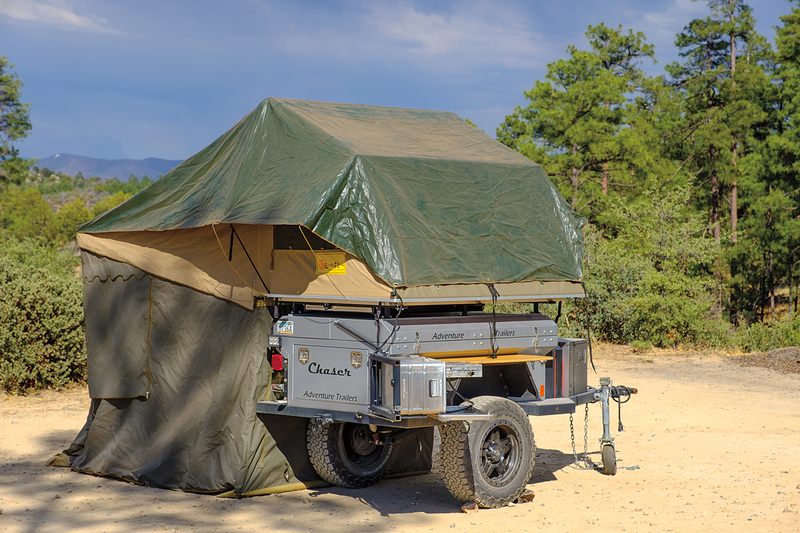 When it comes to camp systems, AT Overland has always gone for the proven and reliable options, and the Chaser is no exception. There is a 19-gallon water tank located on the tongue that uses a manual pump, and two jerry cans for extra fuel or additional water. The table is truly minimalist: a piece of wood that wedges into the fender. 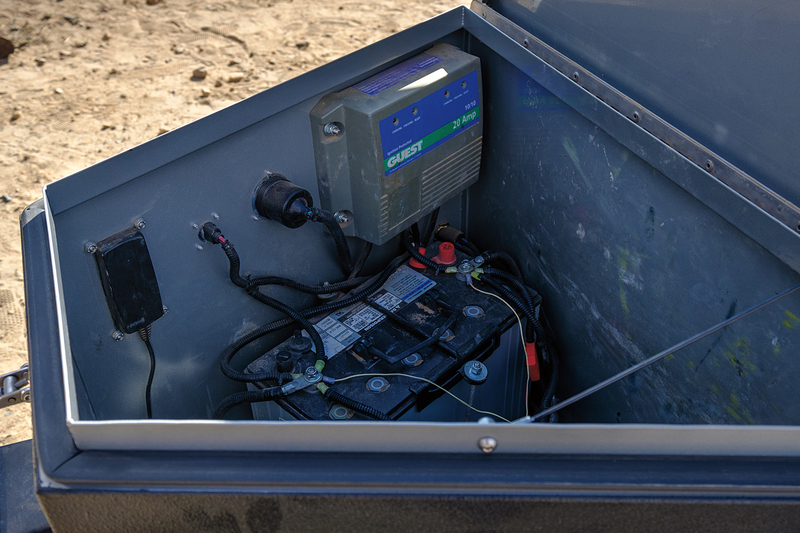 In the tongue box, a single- or dual battery system can be installed with a solar controller and charging ports for devices. 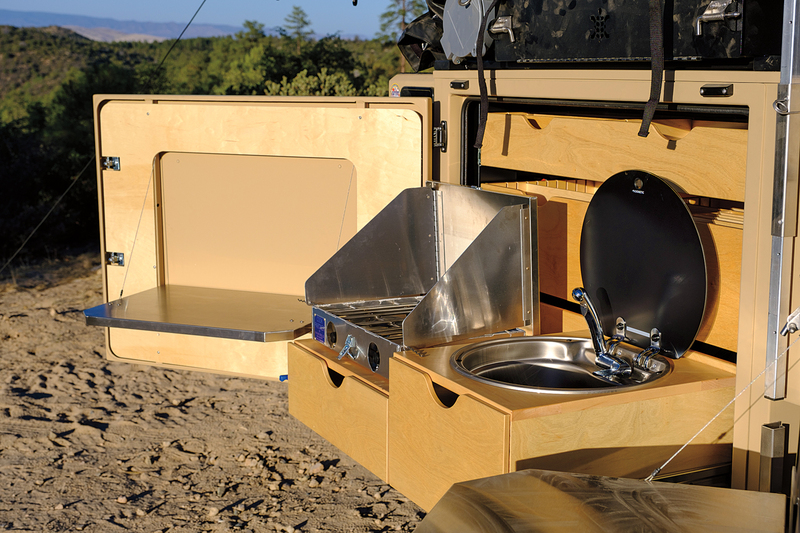 And, if you want to get fancy, a swing-out kitchen can be added to the tailgate which includes a Partner Steel stove. Its brief list of features might seem underwhelming, but what it equates to is an uncomplicated camp experience with a lot of reliability and little fuss—we love it. The Eezi-Awn Globe Tracker tent equipped on our test trailer operated on a similar plane of efficiency. It can be deployed and stored without Herculean efforts, and for the massive amount of space it provides, the setup and breakdown times are shockingly fast. Add its thick mattress into the mix, and it’s easily one of our favorite tents from the test. The main cargo compartment is completely open, with 46 cubic feet of gear-devouring space. This is where your fridge, like the National Luna shown at left, can be installed, and your table, chairs, and other personal items slide in around it. While the straightforward system is appreciated, I don’t like how it tends to bury gear. Even more frustrating, it forces you to access everything by lifting the trailer’s lid, which doesn’t sound like a problem until you’re in camp and the tent is open. Then when you open the lid, something often falls out: your bedding, a forgotten camera, laptop, etcetera. If someone is sleeping in the tent and you realize you have to get an item from the trailer, they’ll need to wake up and exit the tent while you locate your item. We find it difficult to argue with the proven track record of the Chaser. During our extensive experience with it throughout the world, it has always been comfortable, easy to use, and most importantly, has never let us down. What more can you ask for? Is it cold outside? Let me brew you up a spot of tea from the dinette. 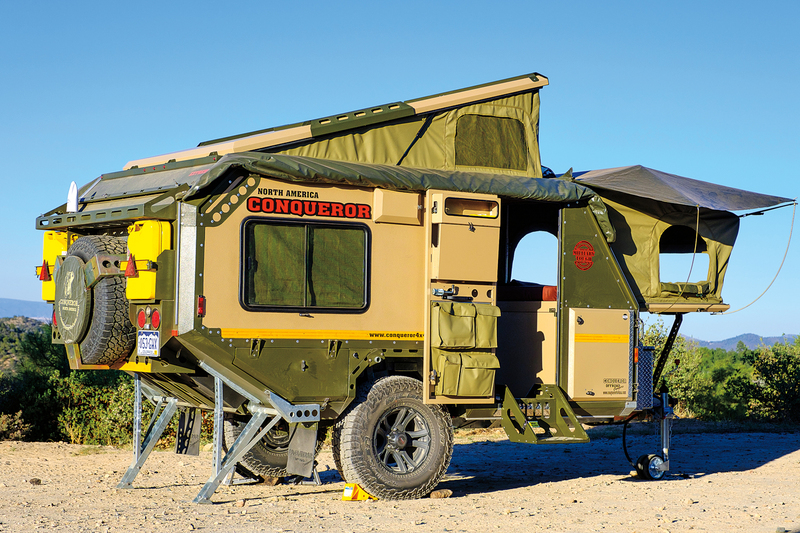 Conqueror started over 25 years ago as a maker of military trailers and equipment, with parent company Mega Manufacturers focusing on in-house design and manufacturing for the South African and international markets. Constructed for the harsh environments of Africa and Australia, the intent of these models is clearly for long-distance, remote travel. The consumer products reflect their military heritage and are given the acronym Urban Escape Vehicle (UEV); the corresponding number reflects the length in centimeters. 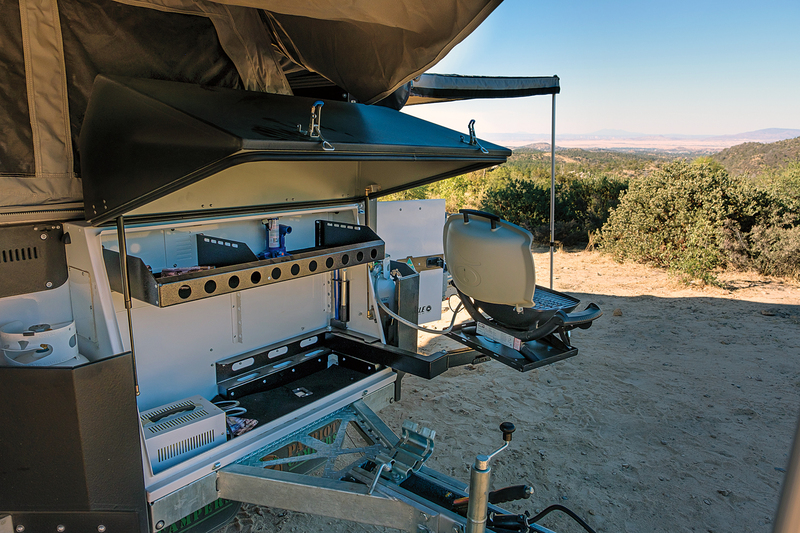 Their UEV-490 is particularly unique, and the one we selected for this test—a live-in and live-around unit—combines the best of camper living with expansive shade and outdoor cooking. It is also one of the few trailers on the market that is designed with abundant interior space, yet is still small and low enough to manage most trail conditions. Thoughtful features are found throughout, and nearly everything is included, down to cups, plates, and utensils. The Conqueror was a joy to tow on the road, the perception of nimbleness and ease of maneuvering belying its dimensions and weight. Much of this is due to the design of the suspension and the positive, rattle-free connection of the Max Coupler. To say that the suspension is plush would be an understatement— the UEV-490 floats over bumps, bridge expansion joints, and broken asphalt. However, this compliant ride did result in more body roll than desired, but the large diameter Tough Dog shocks did an adequate job of minimizing sway. The brakes are also highly effective on both pavement and trail, with the large surface area of a 12-inch drum. The track width was a perfect match to our Tacoma tow vehicle and would pair nicely with most SUVs like the 4Runner, Grand Cherokee, and Discovery. Unfortunately, the gross vehicle weight (GVW) of 4,000 pounds makes the 490 too heavy for any variant of the Jeep Wrangler. On the trail, the weight of the UEV-490 was noticeable, requiring the most traction control intervention from the Tacoma to clear the cross-axle obstacles. We expected the size to be more of a factor, but it pulled through all of the erosion and cambered challenges our course presented. Even at 29 degrees of side slope, the Conqueror remained stable. The one test the UEV failed to complete was the breakover assessment that resulted in the forward frame section grounding on the top of the berm. No amount of effort from the Tacoma would pull it through, with all four tires ultimately digging holes. 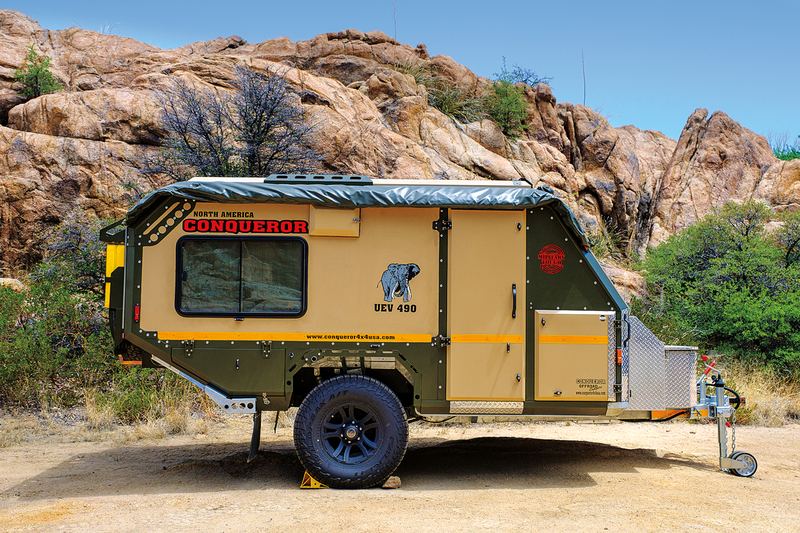 This is not to imply that the Conqueror isn’t suitable for challenging terrain, but the trailer’s drawbar is low and long and will need to be taken into consideration on tracks that include gullies, mounds, ledges, and ravines. While it struggled a bit on the tight technical loop, it was a dream to tow on the backcountry roads of Prescott, Arizona. Again, the suspension glided over erosion cuts, embedded rock, and corrugations. 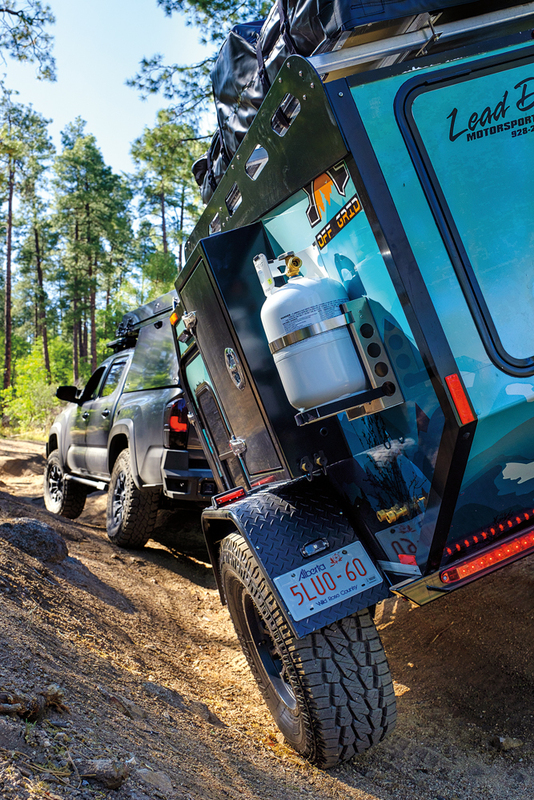 Putting weight aside, it was one of the best trailers overall for towing on dirt roads: the contents were dust and damage free at the end of a long day on the trail. The UEV-490 was easily the largest and most luxurious model in our test. It bridges the gap between compact off-pavement trailers and true caravans, with more features than many of the others combined. Within its walls, you’ll find a flat-screen TV, a hot-water shower, air-conditioning and heating, a microwave, tons of outlets, and even a fan system that creates positive pressure in the cabin to prevent dust incursion while driving. The list goes on and on, yet it wasn’t any one of these features that set the Conqueror apart. That honor belongs to its design. You see, unlike most small off-pavement trailers, the UEV- 490 has enough space for its occupants to stand, move around, and relax. It has a towering insulated roof, a dinette built for four that converts into a bed, a forward fold-out sleeping space, and a small common area between it all. 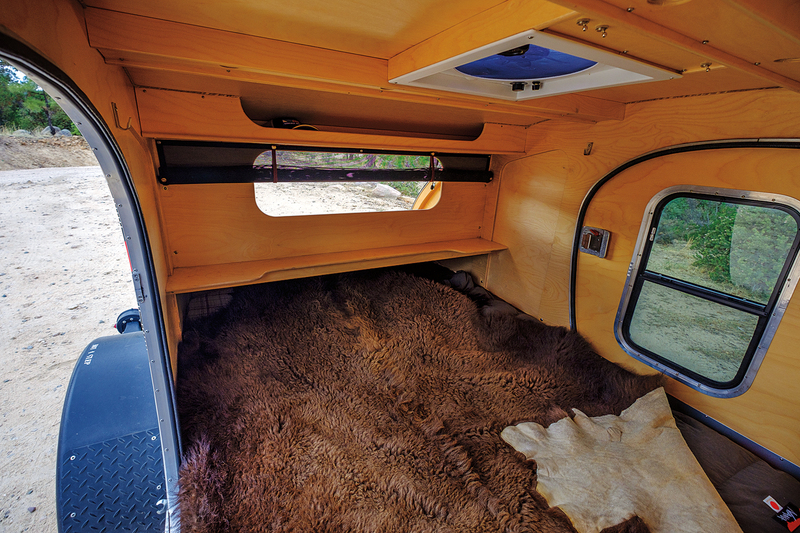 Zippered soft drawers line the inside walls, and large bags may be placed under the bench seats or on the floor. It is a truly livable space from the start, with amenities then added to enhance it. An example is the enormous slide-out kitchen which includes a double-burner stove, dual-zone fridge, and faucet with hot and cold water. There are even plates, bowls, and cups designed specifically to nest in the kitchen drawers without rattling—a nice touch. Unfortunately, the awnings weren’t quite as easy to use. Our test unit had the standard canvas model, and I found it to be incredibly difficult to work with. They do offer a Bundutec rapid deploy option, but we didn’t have the chance to test one. My only other criticism is related to the fit and finish: the design is phenomenal, but the execution is lacking. Metal shavings were still present in some places, edges weren’t filed, and I couldn’t help but feel that the military vibe clashed with the luxurious amenities it boasted. 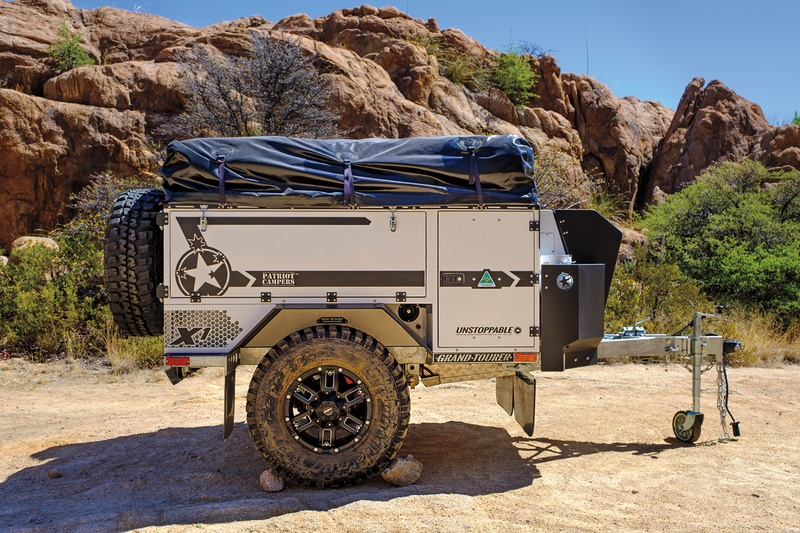 Still, if you’re looking for a trailer that can go nearly anywhere in the world while delivering the comforts of home, the UEV-490 is hard to beat. The escape pod with 35-inch tires. 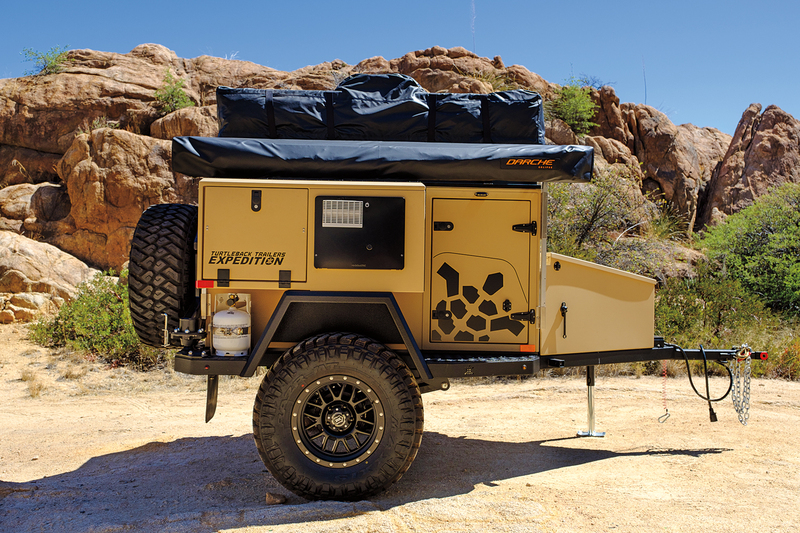 The only Canadian-built trailer in the test, the Expedition went after the sweet spot of the overland market by combining a sleep-in and camp-around design with durability and off-highway performance. It’s certainly a developing trend, and for good reason, as it integrates to many of the approaches that travelers need and cannot easily incorporate into just the tow vehicle. The company was started by Mark Badgerow a few years ago and is one of the youngest inclusions to this test. Off Grid’s evolution is not unlike many others, with an active innovation cycle and continuous improvements in both materials and construction methods. Most notable is their shift from using wood cabinetry and shell materials to lightweight and durable aluminum. Their approach also reflects the environment they live in: the sleeping area is fully insulated, and there is a Propex propane heater option. All of this effort resulted in an impressively low curb weight at 2,200 pounds, including all options as shown and 35-inch tires. 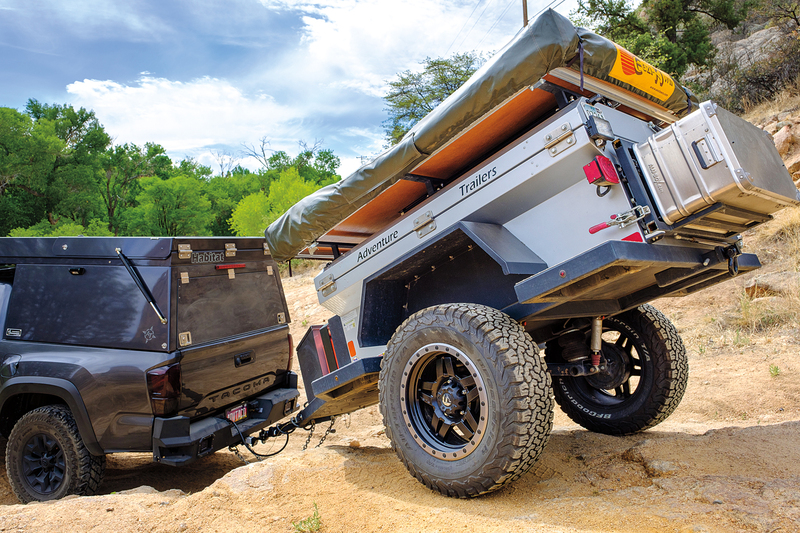 The lightweight and stable Timbren Axle-Less suspension results in a trailer that is easy to tow and boasts the second largest overall interior volume, while fitting the largest tires in the evaluation. Despite the overall size, it pulls well on the highway, and this capability would further improve if the roof tent wasn’t specified. My one major concern was the lack of trailer brakes, a shocking omission given the 2,200-pound curb weight. This is a safety issue and also eliminates several useful trail techniques to help manage a trailer in tight obstacles. Despite my major gripe, the Off Grid did track straight and remained stable and predictable on all of the surfaces we evaluated. When the going got rough, the Off Grid was impressive. 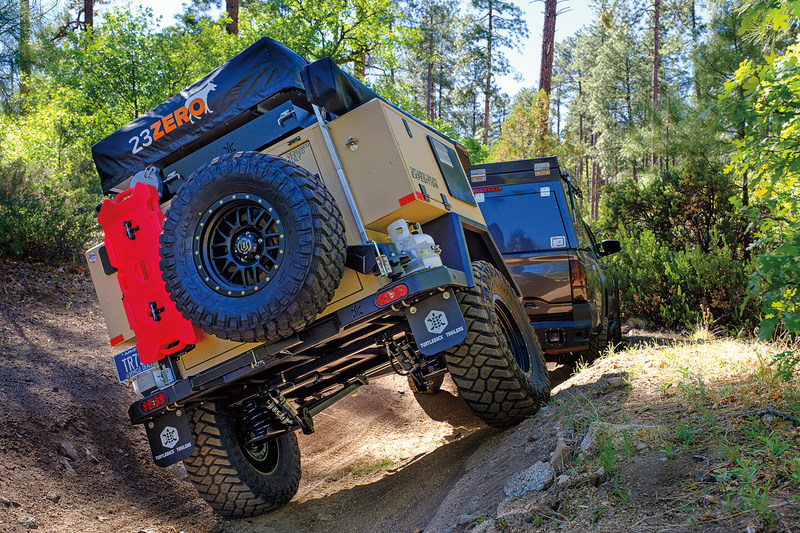 Again, the Timbren suspension nearly matched the performance of some of the longer- travel independent models, and the massive 35-inch tires swallowed every gully, rock, and root we tossed at it. The approach and departure angle are well matched to the overall dimensions, and the angle of the rear storage box kept the body from ever making contact with terra firma. The rear is also protected by a full-width bumper, and the fenders are made from oversized tubing that connects to the frame. The safety chain connection point is lower than it needs to be and would be the first thing to hit on the drawbar. This is not a small trailer, but it towed easily on the technical course. For the corrugated road, the suspension did not equal that of the Patriot or Conqueror, but it did not bounce around much either. The Expedition provides serious shelter in a trailer suitable for technical trails and long-distance hauls. The Expedition comes equipped with an array of accessories designed to make your experience as enjoyable as possible. That all starts with a good night’s rest, which you’ll find on the generously sized, high-density foam mattress. There are convenient shelves for storing your phone and sundries nearby, as well as charging ports. If you decide you can’t sleep, you could always watch the flat-screen TV which is powered by two deep cycle batteries housed in the forward compartment. Storage is abundant and largely contained within the rear hatch and two large interior compartments. The aft storage area is split into halves, with three shelves per side, allowing you to separate and organize your gear. 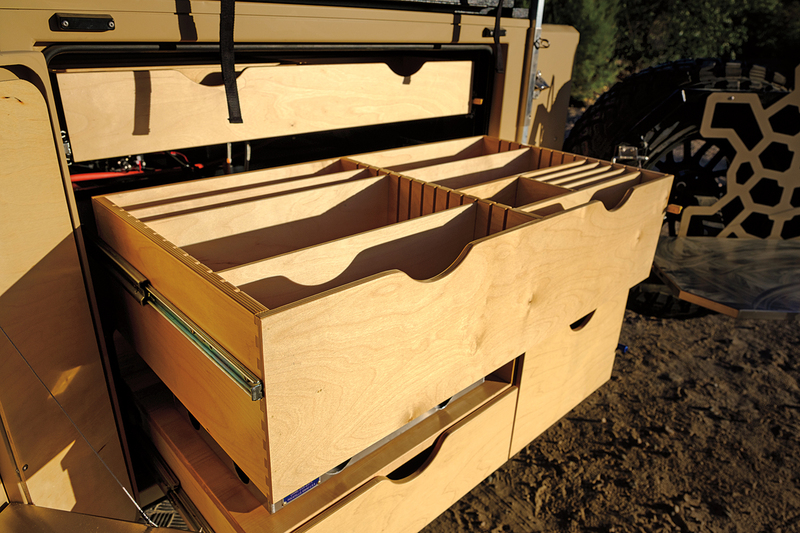 The two interior drawers are perfect for clothes, computers, and other personal effects, but there is one major flaw: the lids open upward, and there are no struts or locks to hold them open. This forces you to hold them with one hand, and search in the dark cabinet with the other. 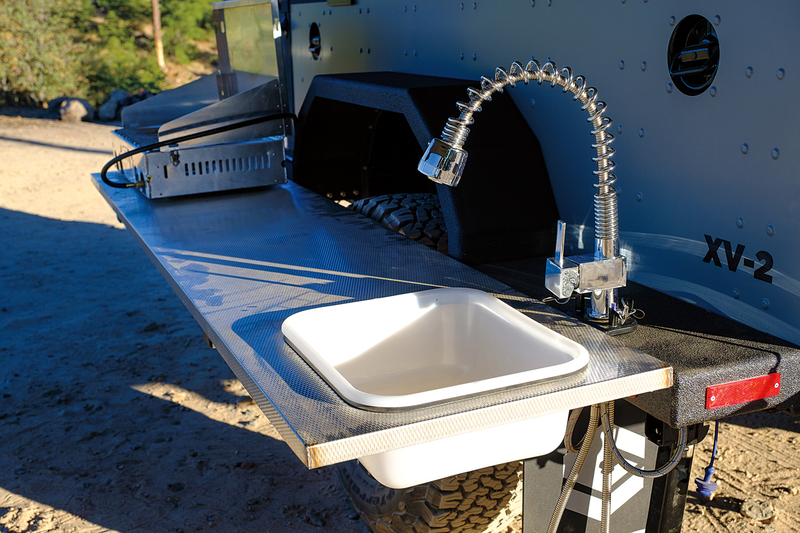 The kitchen in the Off Grid is both clever and practical. 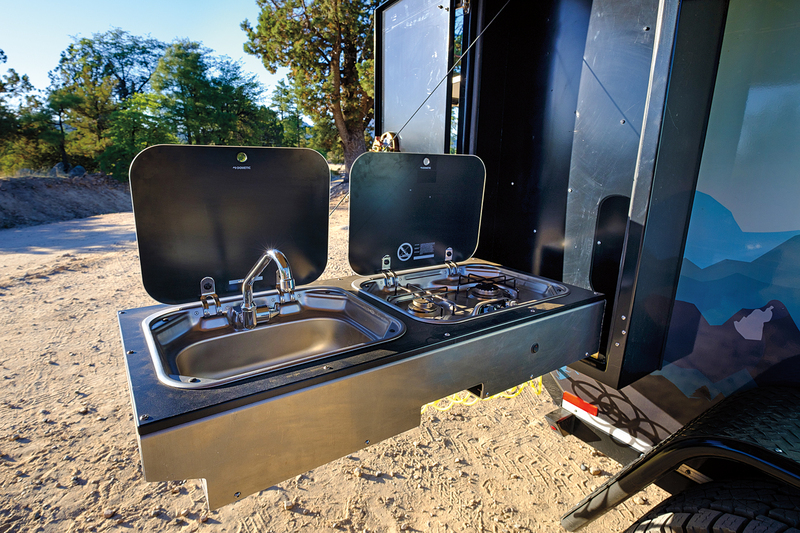 It drops out of a tall and slim compartment on the side, revealing a dual-burner stove, sink, and faucet ready to go. All you have to do is plug in the quick-connect fittings. The Dometic fridge is on a slide and located directly behind the cooking area in the forward compartment for easy access. After spending time with the Off Grid, I found plenty of things I loved and few things I didn’t. The spray-on insulation beneath the trailer looked a little sloppy, and there was some silicone caulking that could have been neater, but none of that really mattered. At the end of the day, the Expedition was comfortable, quick to set up, and straightforward to use—a clear winner in my book. The ultimate base camp, with the suspension to get you there. If I could choose one word to describe Patriot Campers, it would be exciting. 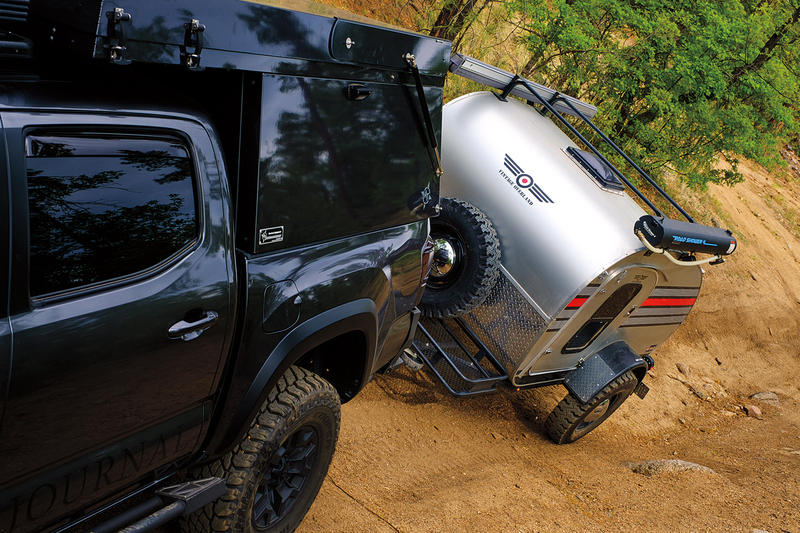 Between their high-energy and much-loved CEO Justin Montesalvo to their Super Tourer Land Cruisers, this rapidly growing company has taken the market by storm. Their success is not just about show, but building quality trailers that are manufactured with a high degree of precision and innovation. 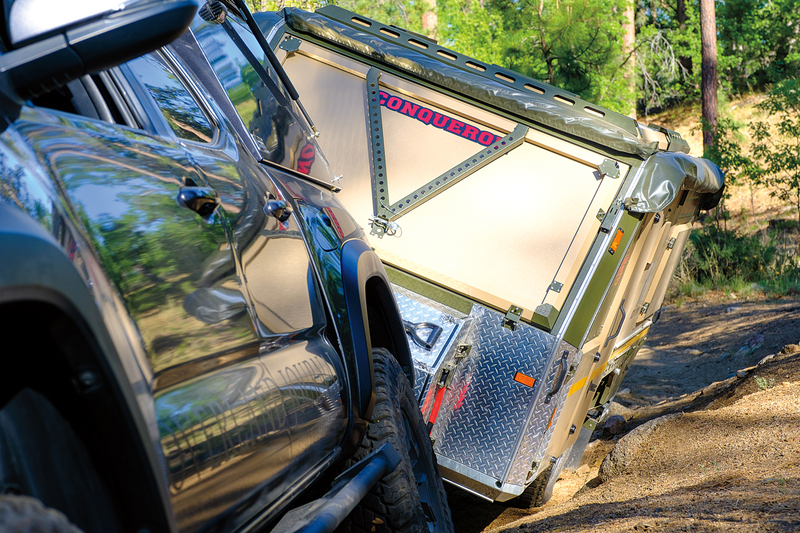 Relatively young at four years, the Australian owned-and-made product has won the respected Camper Trailer Australia magazine Trailer of the Year Award for four years in a row. In early 2018, I had the opportunity to tour Patriot’s facility in Australia and saw firsthand the attention to detail of the production process. Their assembly line looks reminiscent of an automotive plant: large sheet metal presses and stamping machines were complemented by laser cutters and welders. The brand’s quality is also born from necessity, as there are few travel conditions in the world as rough as the Australian Outback, where extreme corrosion and endless corrugations demand durability above all else. 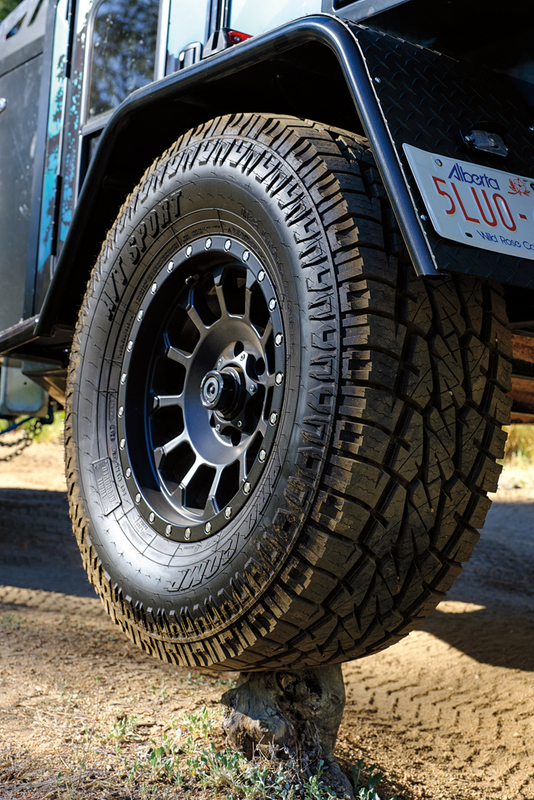 The Patriot camper starts with the right foundation, focusing on the performance and durability of the suspension. The robust independent A-arm design is produced in cooperation with Cruisemaster and includes a long-travel airbag and twin 35mm shock absorbers on each side. There are even thoughtful considerations like an integrated jacking point on the A-arm to help locate and stabilize the lift point while changing a tire. During our testing, the X1’s suspension was the cornerstone of the road and trail towing effectiveness, remaining stable at high speeds, but still compliant over rocks and ruts. The Tourer is lighter than expected given the amenities, coming in at just over 2,400 pounds, which made it the true middleweight of the test. This also facilitated towing ease, complemented by the large drum brakes that helped stop the train. 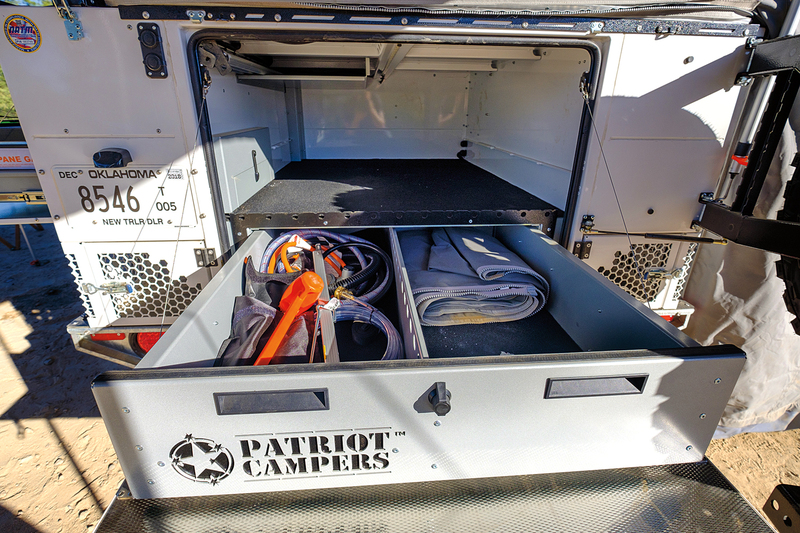 In the backcountry, the Patriot is at home; it effortlessly completed all of our trail tests and asked for more. What made the X1 stand out was its performance in both the technical loop and on the open, corrugated fire roads. In challenging terrain, the compact dimensions, modest weight, and generous ground clearance allowed us to push the limits of approach, departure, and side slope capability. The only unprotected body panels are the replaceable corner bottle trays. The unique DO35 coupler allows for full off-highway angles in uneven terrain, but it is also easy to attach with a self-centering pin. For the dirt roads, the plush suspension soaked up everything the Toyota did and showed no sign of bottoming or topping out over wallows and berms. It was settled and confidence inspiring, exactly how a suspension should perform in those conditions. When it comes to setting up your base camp, you’ll find that the X1 is second to none in quality and execution. Just take a look at the armature on their grill or the frame of the bed, and you’ll begin to understand. Each component has been completely overbuilt, yet engineered to be manageable through leverage or gas struts. For example, raising and lowering the awning bracket on other trailers can be a chore, even backbreaking, but the X1’s armatures move skyward with a gentle, strut assisted nudge. Leveling the trailer for camping is a cinch, using the built-in compressor and airbags to adjust the ride height at the flip of a switch. This is not only useful while driving, but when parked on a hill in camp. The stove, sink, fridge, and prep table are built onto heavy-duty slides and are 100 percent ready to use the moment you pull them out. 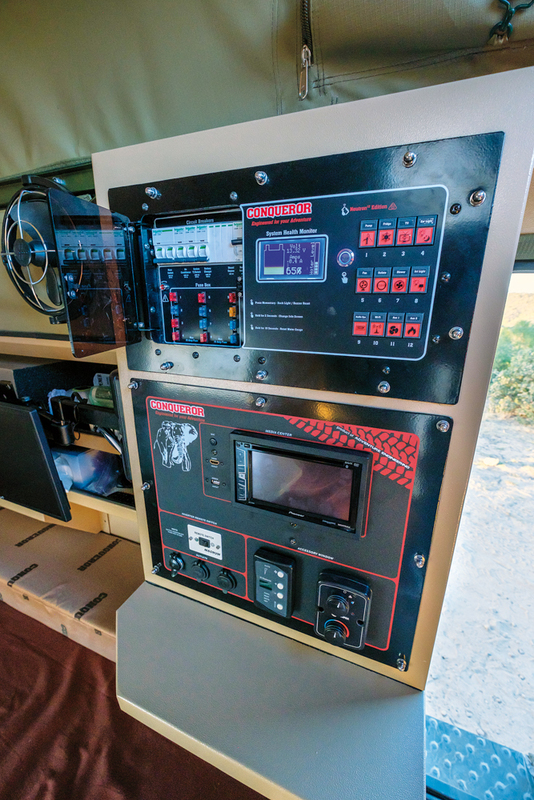 There are gauges that monitor water levels in the tanks, the drawers and cargo compartment are lined with soft materials to prevent harsh impacts and rattles, and the stereo and electronics are easy to operate. Then there’s the sleeping situation. 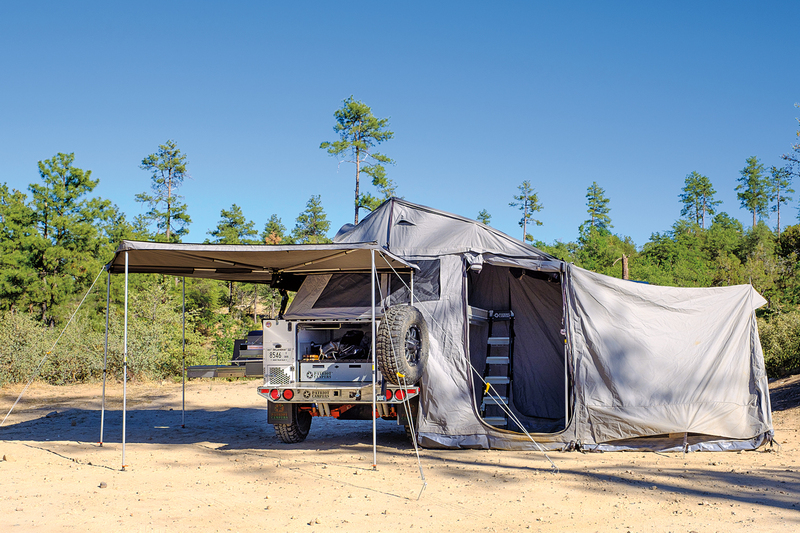 The CS3 QuickPitch integrated tent sets up quickly and easily in its basic configuration and provides loads of space to move around in or to set up living quarters. It has a spring mattress, and very little to complain about. That is unless you decide to assemble the entire canvas city provided with the X1. For that, you’ll be wrestling with an awning, an add-a-room, and the burning question of why you bought a trailer if you still have to set up a massive tent anyway. Fortunately, you can leave that part at home and enjoy this marvelous Tourer as is with ample room for four. Quality and innovation, at a serious value. 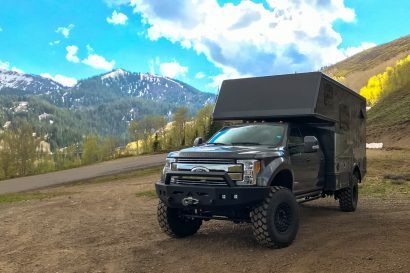 The entire focus of Turtleback and company owner Dave Munsterman is building trailers. They do not produce anything else, and they keep side projects to a minimum, which has allowed the company to become one of the highest-volume, most-respected brands in the North American market. This singularity of attention is also evident in their 11,000-square-foot facility and their products. The manufacturing plant is complete with dedicated assembly lines, overhead cranes to improve efficiency, and proprietary machinery that ensures consistency and quality of construction. Dave’s story is not unlike many represented here: with a background in the RV industry and a passion for the outdoors and off-road racing, his formative years were spent learning how to build things that last and endure the abuse of the Desert Southwest and Baja. Turtleback is the classic tortoise story, one of steady plodding and a laser focus. Their strategy has paid off, with Dave and his team on track to produce 120 trailers in 2018—focused indeed. Towing the Turtleback on pavement was a pleasant enough process, checking all the right boxes of stability, low noise, and track width. The weight of the trailer is on the heavier side, and the center of gravity (COG) was higher than most in the test, so sway was noticeable, particularly during quicker transitions on curvy mountain roads. The brakes were effective and smooth to engage. One notable evolution with the Expedition is the newly available independent, coil-sprung suspension. What it lacks in adjustability (without airbags), it makes up for in reliability and overall wheel travel. Custom valved, remote reservoir Icon shocks control damping. The Hyperco coils can be moved to three different positions depending on the load and desired ride height. On the technical terrain course, the Turtleback made easy work of every obstacle, including a recently felled tree that blocked the entry to the cross-axle gully. The 35- inch tires and compact dimensions made it one of the most capable in the test, and there are no body panels unprotected from rock impacts. 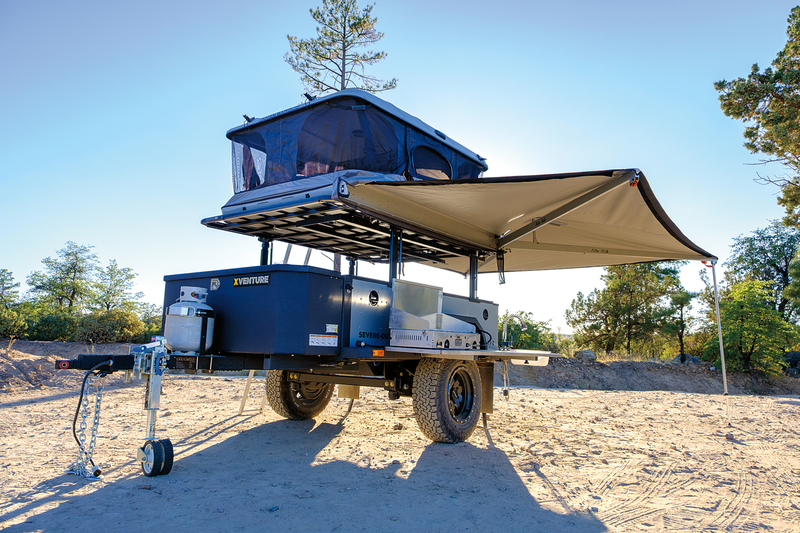 The one concern in the technical section is COG; the trailer is not only tall, but both the water (380 pounds) and fuel storage (25 pounds) are above the frame and upright. This was noticeable in the camber testing (30-degree side slope), where the trailer completed the test, but the uphill tire could be pushed off the ground. For the dirt road testing, the Turtleback was compliant and competent, showing no hard bottoming and minimal chatter or drifting over corrugations. 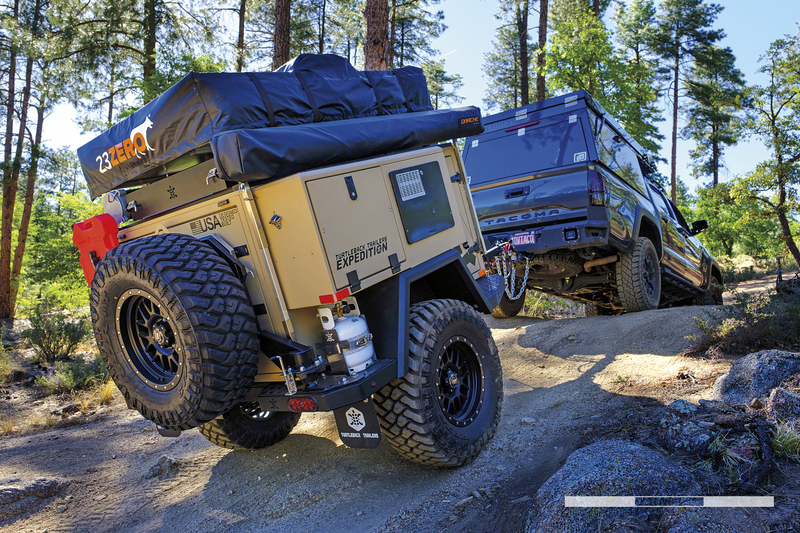 The suspension is a big improvement over the Dexter axles used on previous Turtleback test units, greatly increasing the chance that the eggs and beer arrive in one piece at camp. 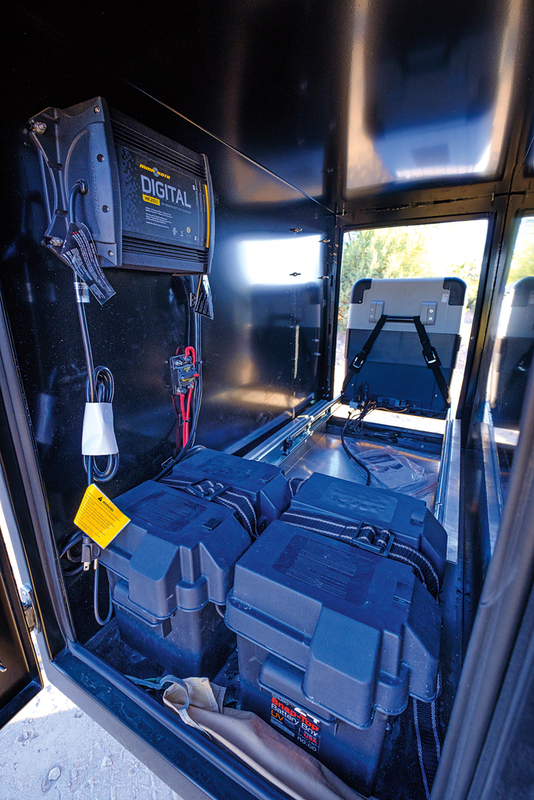 The core of most off-pavement trailers is one gigantic compartment for your gear. In theory, this is the most space efficient way to do things, but it can drive you nuts when all you want to do is pull over to make a cup of coffee, except your stove is buried under a pile of stuff. That’s where the Turtleback comes in. Their Expedition is a purpose-built blend of cargo and touring trailer, designed to make life on the road a snap. Its 50 cubic feet of storage has been carefully compartmentalized, giving you organized access to whatever you need quickly. The main hold is perfect for large items like chairs and bags of clothes, while the side boxes are useful for quick-access items like a medical kit. 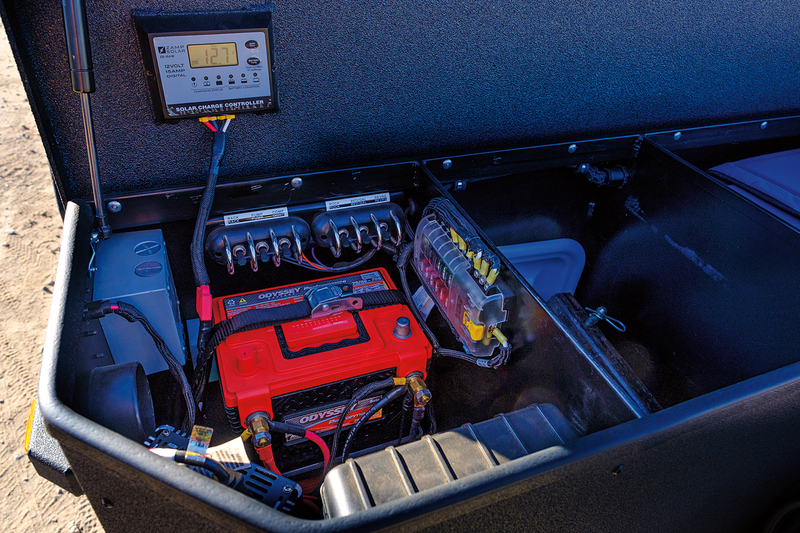 In the oversized tongue box, you’ll find a masterfully laid-out electrical system with dual batteries, an inverter, and loads of extra room for things like wheel chocks. The most impressive section is the rear cargo compartment though. That’s where you’ll find the rather extensive kitchen, comprised of two fold-down side tables, a main stove and sink slide, and two enormous drawers with built-in dividers. Together, they provide enough space for all of your small items, personal effects, toiletries, and, of course, cookware, with one glaring exception: a fridge. One can be added of course, but at the loss of space in the main cargo compartment. I found the 23 Zero tent equipped on our test trailer to be both comfortable and spacious, but I prefer hard-shell tents since they dramatically reduce setup and breakdown time. By the end of our evaluation, there were plenty of things I liked about the Expedition, but the one that set it apart was the attention to detail. Their finish out is perfect, components are top notch, and best practice implementation is always used. They even go above and beyond by providing a full manual, covering everything down to the wiring diagrams. Turtleback has become a top contender. I first met Britton Purser of Vintage Overland in a dusty parking lot outside of Bluff, Utah, his family in tow and all smiles to loan me their teardrop. We talked adventure motorcycles, design, and Land Rovers as the sun baked the six of us. His enthusiasm for handcrafted items and classic style is not only evident in his personality, but in the trailers that he and his brothers produce in Grand Junction, Colorado. Bespoke manufacturing is a phrase often tossed around by guys in cheap suits with Cockney accents, but Britton lives it. 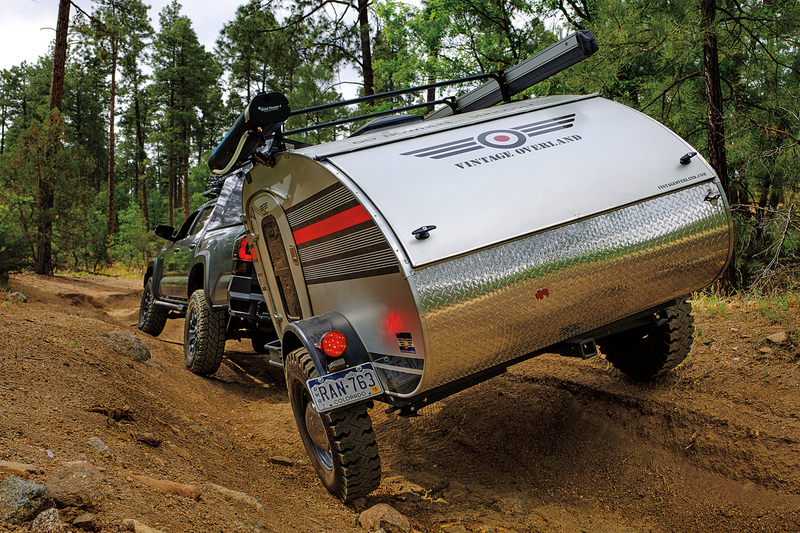 The Vintage Overland trailer is admittedly different than the others tested; with an emphasis on simplicity and classic styling, it lacks the massive tires and long-travel suspensions of its competitors. But what it does have is longevity, never looking dated or like last year’s model. It also exudes quality, with many of the woodworking and metal processes cut and finished by hand. With the growing popularity of using older vehicles for travel (like a Range Rover Classic or Land Cruiser 70 Series), why not put a trailer in tow that looks right at home? On the road, the T.E. Lawrence (aka Lawrence of Arabia) is a pleasure to pull; its 1,180-pound curb weight hardly noticeable behind the Tacoma or G-Wagen. The shape is also slippery to the wind and makes a noticeable improvement to fuel economy over more boxy trailers. With the wider track and stiff Dexter torsion axle, the trailer handled well, although it was a bit busy over rough pavement. 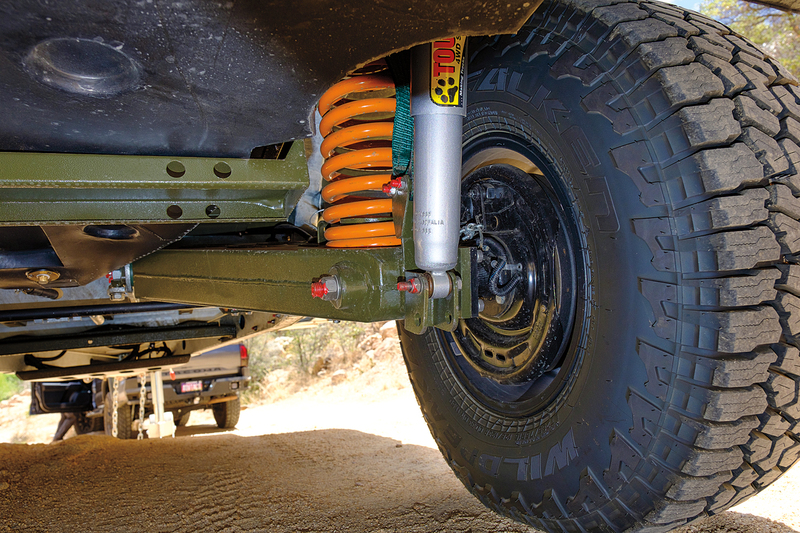 The lightweight and negligible suspension travel encourage any abrupt bump or wallow to send the trailer airborne (though not very high). When towing on steep mountain roads, I noticed the lack of brakes; they are a strong recommendation for any trailer that is more than 1,000 pounds, particularly when towed by a vehicle that is already approaching GVWR. Road trips with the Vintage Overland are fun, as almost every vehicle that passes gives a wave, thumbs-up, or points a camera (or cell phone) at it out the window. For the dirt, things got a little more challenging for the teardrop, the lack of wheel travel causing the T.E. Lawrence to buck and bounce wildly at anything over crawling speed. Even typical dirt roads were abusive, rattling anything beyond soft luggage. To its credit, nothing on the trailer failed, and it looked no worse for wear, but it is a serious limitation to speed-mixed terrain. For the technical trail segment, the Vintage Overland did hold its own, with reasonable ground clearance, a wide track, as well as being the lightest unit in the test. It completed all of the cross-axle challenges without damage and traction control intervention by the tow vehicle was limited. For the trail section, I wished the T.E. 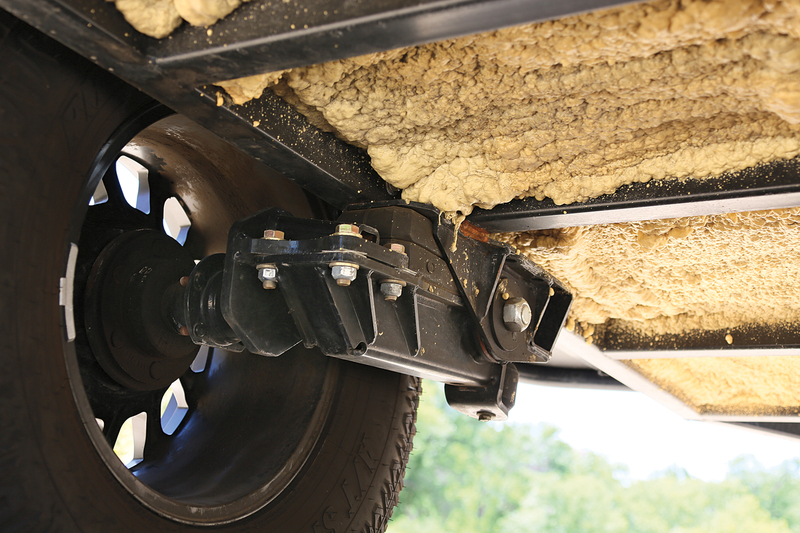 Lawrence had a more compliant suspension to help insulate the trailer and contents. We also noted that the forward section of the frame needed either more tubes or thicker wall tubing to better manage a (visibly) noticeable beaming effect. We’d also like to see brakes available as an option and 7.5R16 wheels and tires for additional clearance. 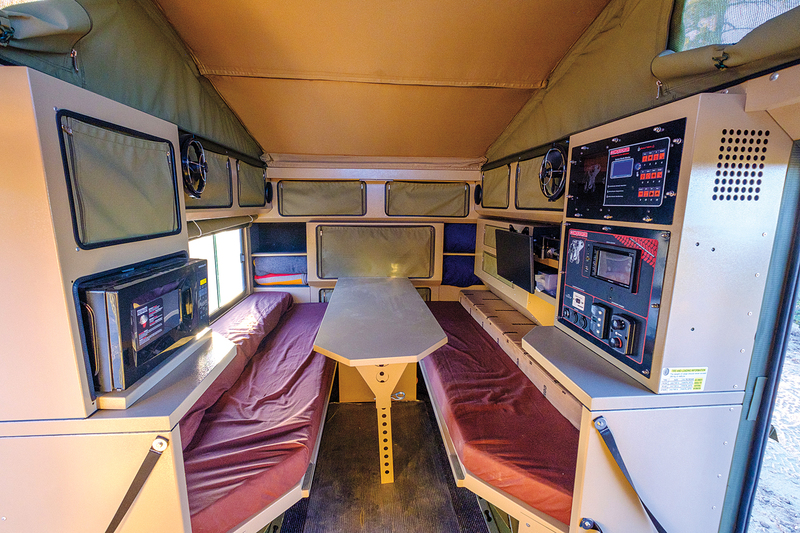 Stylish, classic, comfortable, timeless—these are just a few words I’d use to describe the Vintage Overland trailer. It’s a return to simpler times, when you didn’t need a stereo and a high-powered blender to go camping. Back then, a fire was your social media, the stars your auxiliary lights, and a teardrop trailer your vessel of escape. Like the classics that inspired it, the T.E. Lawrence has no elaborate tent structures to set up, no complex electrical systems to work, and no intricate accessory systems to go awry. Some might see this as sparse to a ridiculous degree, but by removing all of the complexities, you’re not worried about the fridge draining your battery, the water heater running out of propane, or a troublesome electrical fault that you can’t seem to track down. Your sole focus is the trip, your family, and your surroundings, which is how it should be. Of course, this intentional reduction in amenities doesn’t mean the trailer is uncomfortable. 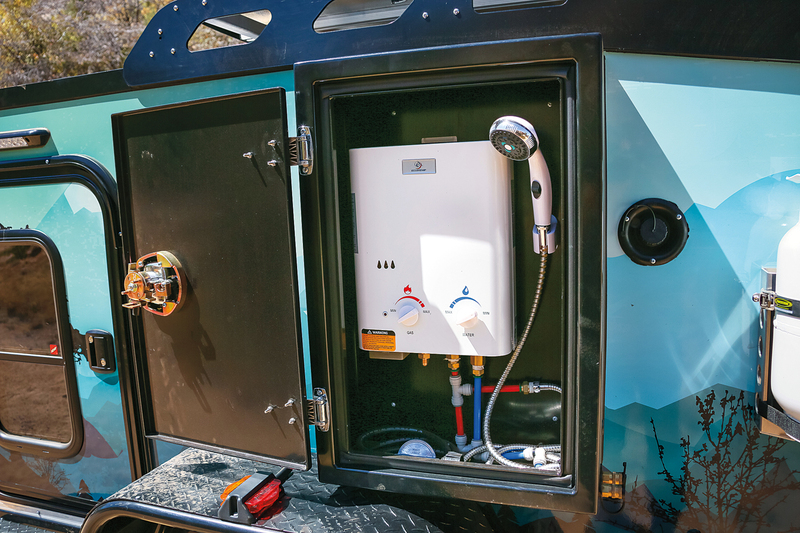 Our test unit came equipped with a solar-heated road shower for rinsing off and an ARB awning for shade from the scorching sun. Inside, you’ll find a queen-size memory foam mattress to sprawl out on and small storage shelves for your book, glasses, and other treasures. LED lights sip power from a portable Goal Zero power source in the rear of the trailer, which can also power most of your devices, although it must be moved into the vehicle for charging. 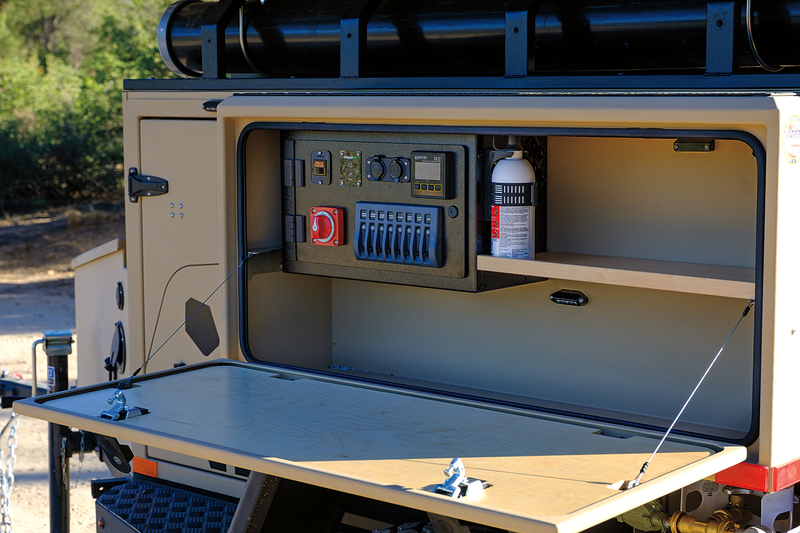 A fair amount of storage can be found throughout: from a small rack in the front to hold wood to space for your cooler, kitchen supplies, and a stove in the locking rear hatch. The foot of the bed contains additional room for cargo and can be accessed through a flush hatch in the boot. Unfortunately, there are no tie-down points in any of these areas, so items are free to slide and bounce around at will. 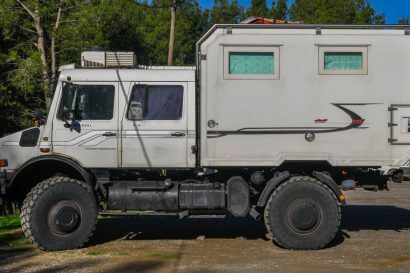 All in all, I love the spartan appeal of the Vintage Overland, as well as its retro looks, but I feel like the lack of amenities is mismatched with its price. The do-it-all trailer that looks at home behind an M1 tank. Schutt Industries has a long history of producing extreme- duty cargo handling equipment for every branch of the US military, their trailers in use behind Humvees and medium-duty transport trucks. 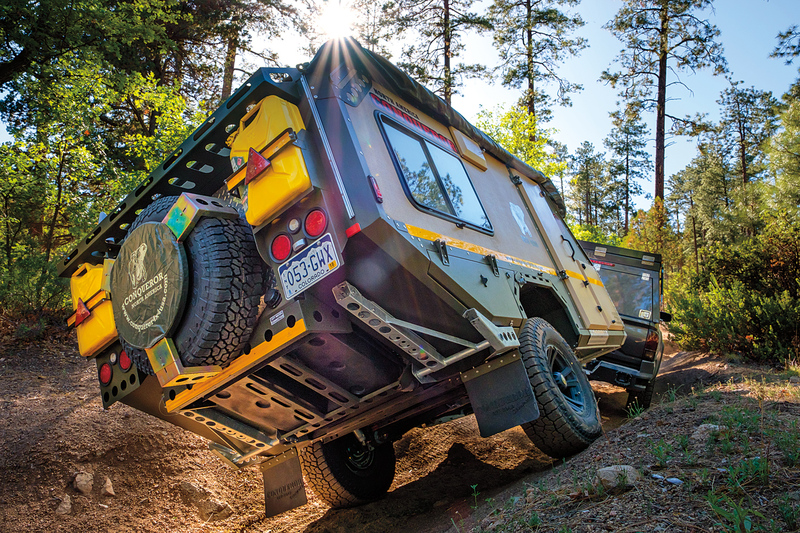 This built-to-purpose philosophy has extended to their consumer line of overland models. Their construction methods are unique, employing the use of an aluminum structure and Alcoa’s HuckBolt fasteners instead of welding. These bolts have a 5,000-pound sheer strength and do a better job of retaining critical coatings and ensuring repairability of every panel and chassis member. The team at Schutt has also done an excellent job of learning from and listening to the overland community. They have fitted proven accessories and made improvements based on feedback from our team and their customers. 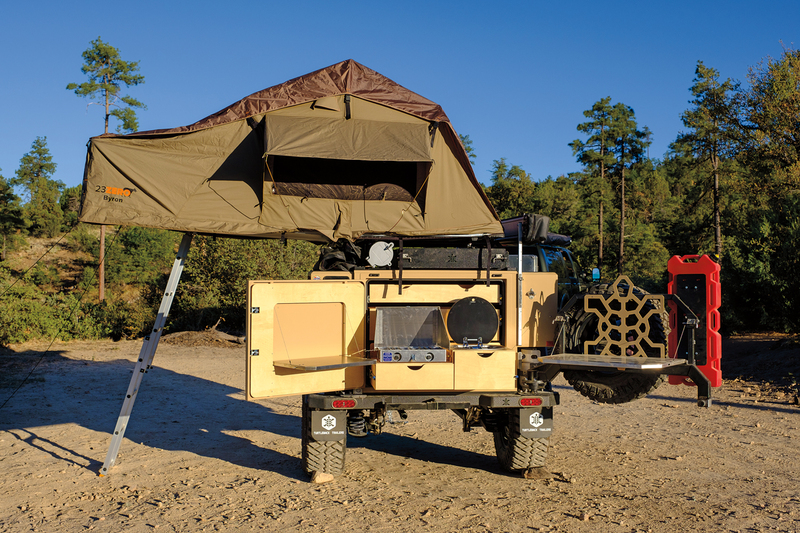 Their trailers are some of the most useful in the industry, working as a utility item for domestic duties, and a full-blown adventure platform for an overland trip around the world. Their trailers have been used on respected expeditions, like XOverland’s journey to the tip of South America. 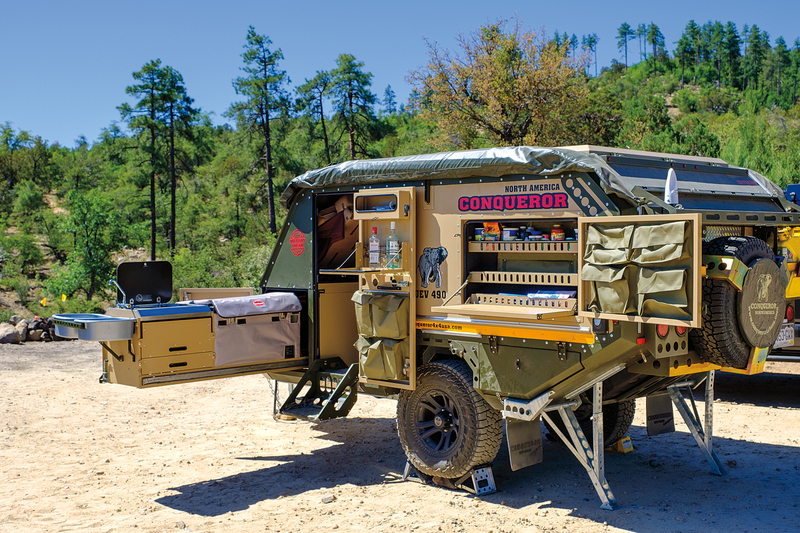 If there were any trailer built to survive any calamity, it would be the XVenture, born out of the conditions of combat in some of the most rugged environments on the planet. The XV2 is all about versatility, which is something often lacking in other offerings. We owned an XVenture for years and used it for everything from hauling yard waste to moving appliances to hauling motorcycles to multi-day backcountry forays. 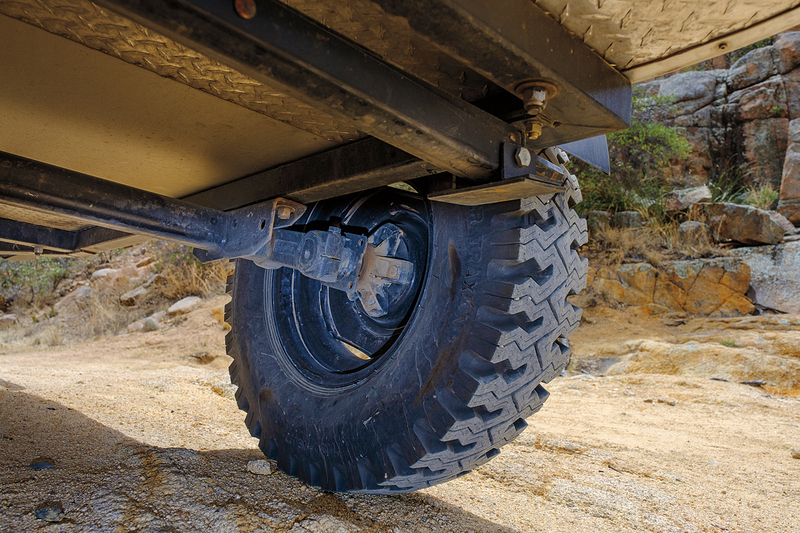 With their new option of the Timbren Axle-Less suspension, gone are the dramatic “air shows” where the trailer would launch off of railroad crossings and potholes. The standard suspension is quite durable but can be destructive to anything contained within the trailer. Towing on pavement is a pleasure with the new Timbren swing arm system, and it is complemented by strong brakes, a wide track width, and a low center of gravity. 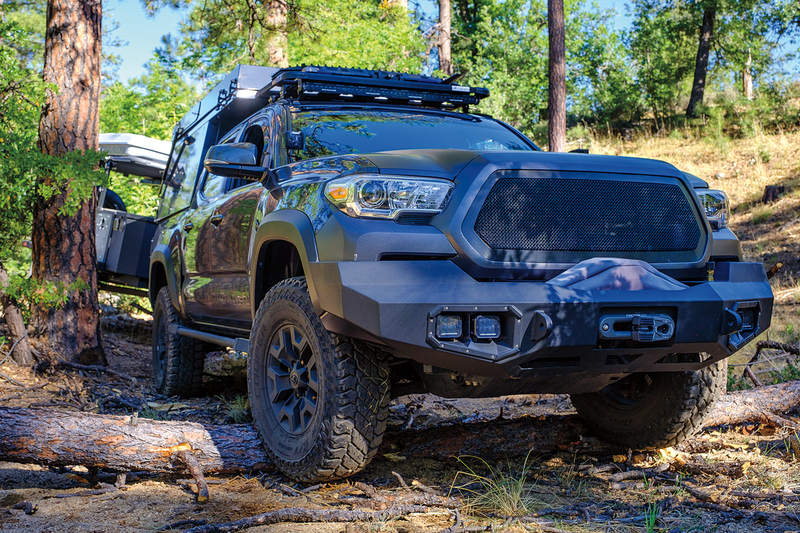 In the dirt, the XVenture inspired confidence when towing in the technical obstacles, with a perfect 63-inch track width following exactly in line with the Tacoma. The ground clearance is generous, and the extremely low COG made the XV2 yawn at any side slope we dared expose it to. The entire perimeter is protected from damage by a massive frame which extends beyond the body to match the width of the fenders, making for excellent stone guards and a perfect perch to access the rack. On the higher-speed dirt, the XVenture needed additional weight in the storage area to get full compliance from the suspension, so it was rougher than some of the others. The rack also rattled from time to time, the downside of it being height adjustable. One final note is that the Timbren suspension on our test unit was the first installed on an XVenture and its availability is undetermined. We also noted that the camber was not set properly, which would influence (negatively) some high-speed handling characteristics. If I could give an award to a company for the most significant improvement in execution, it would be XVenture. They spent the past few years honing their existing designs, and I’m happy to report that it has paid off in spades. Their latest generation has all of the luxuries you’d find in the original but wrapped in a package that is simpler, smoother, and easier to use than ever before. The kitchen still utilizes a metal table which slides into the side of the trailer, but it is now stored beneath the roof rack instead of inside the front of the trailer. The faucet drops into place with the same quick-connect fittings we loved before, but a new and more powerful stove has been added. Unfortunately, the 50-quart ARB fridge is still mounted inside the confined nose box, which will result in increased draw and decreased compressor life due to poor ventilation. The electrical system has also had a major overhaul. Gone are the Goal Zero Yetis and daisy-chained cables. 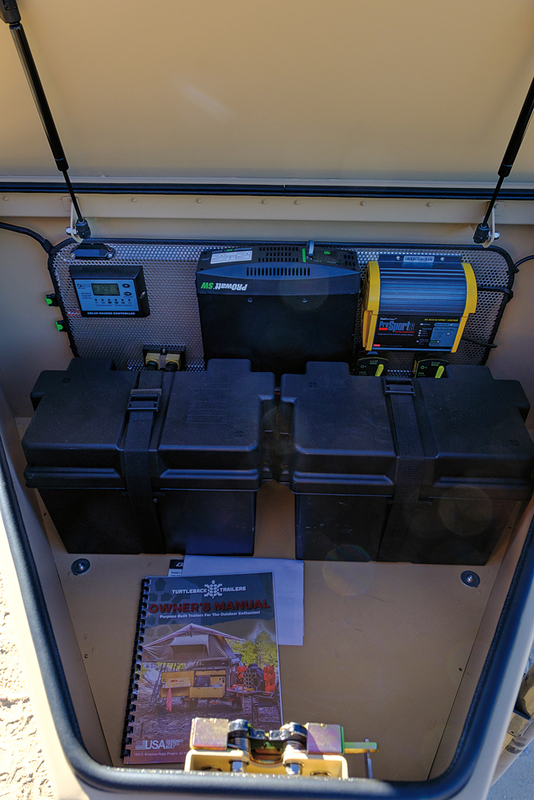 They’ve been replaced with dual Odyssey batteries and a Zamp solar controller which provide a much more efficient and effective source of power in camp. 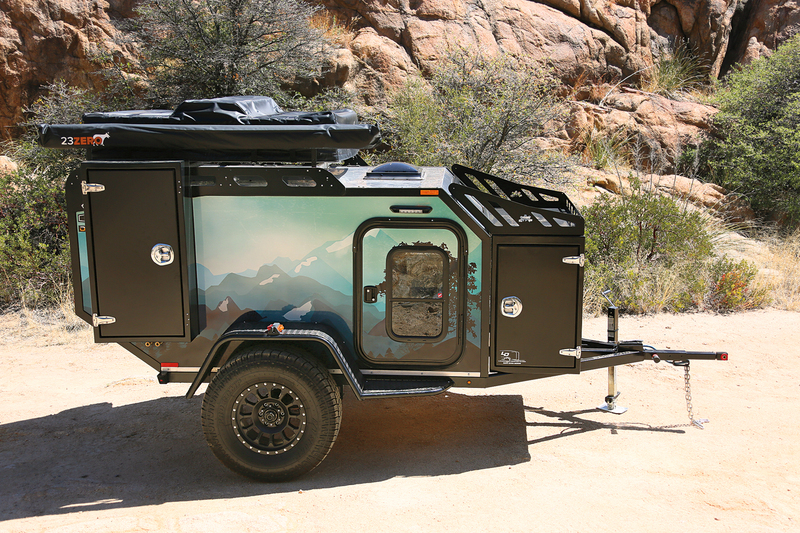 The storage space is cavernous with 58 cubic feet of room for cargo under a removable tonneau cover and a whopping 2,300-pound payload, making it equally well suited to hauling your family’s camp gear or construction supplies and dirt bikes. All you have to do is raise or lower the tent rack to suit your needs, which no longer breaks your back thanks to their recent addition of hydraulic struts. The James Baroud tent on our XV2 was both quick to set up and comfortable, and the Alu-Cab awning was a huge improvement over the original Foxwing. Overall, the XVenture delivers a ton of features with a relatively low setup time. 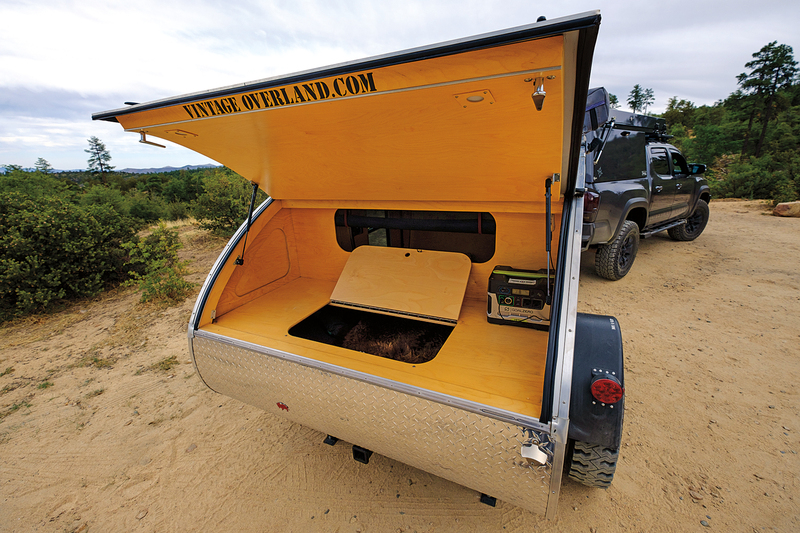 It’s one of the most versatile trailers in the test for hauling gear and toys, but if you’re only looking for an overland trailer, the lack of compartmentalized storage may be a deal breaker. Trailers are a useful tool for the adventure traveler, providing additional space and creature comforts in a tow-behind package. However, some uses of trailers can cause more complications than they solve, so it is crucial for the buyer to consider their most critical demands against the potential downsides. In particular, avoid buying a trailer if the same solutions can be achieved with the vehicle alone. Simplicity is the key, but there really is only so much storage volume in a Defender 90, so the family of four might very well need a trailer to go camping for the weekend. In 2007, I made a trip to the Arctic Ocean with three big guys in a small Tacoma. Between all of the cold weather gear and filming equipment, we absolutely needed the Chaser we had in tow. For this test, we made an effort to represent a broad spectrum of manufacturers and styles which revealed the distinct benefits of each model. We also incorporated an evaluation course and repeatable testing criteria that we can use for future tests to maintain consistency. Our subjective observations also reflect our bias as users. For example, after having used trailers for so many years, both Chris and I feel strongly about the advantage of being able to sleep inside something we are towing and investing in. It allows the trailer to provide comfort and convenience that the standard SUV alone cannot. After weeks of testing and data compiling, the objective winner was clear, but each unit did exhibit a compelling attribute. For example, the XVenture provides the greatest utility but lacks amenities. The Turtleback is highly capable in technical terrain and is packed with true expedition support features like 46 gallons of water and durable, independent suspension, but it lacked sufficient storage, and the tent is nearly the same height as on the top of a vehicle, affecting ease of setup and center of gravity. 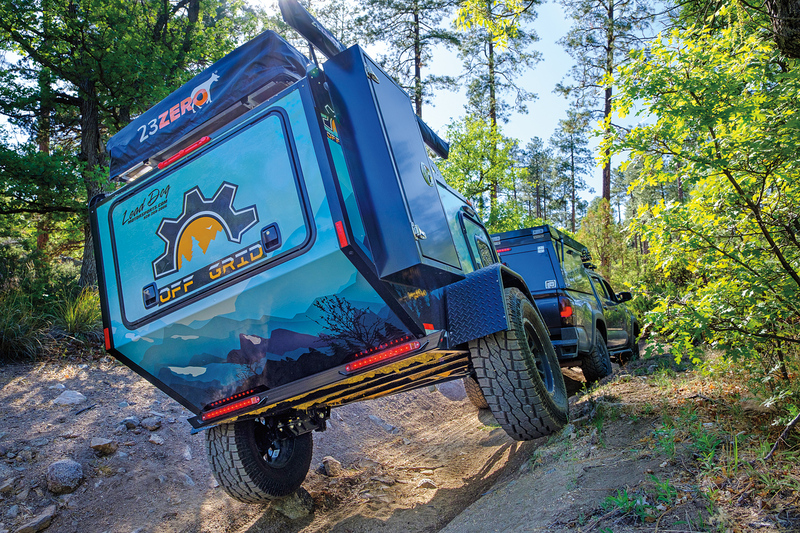 The AT Overland Chaser is the technical terrain king and has a high storage volume for the overall dimensions, but it lacks the comforts of competitive offerings. 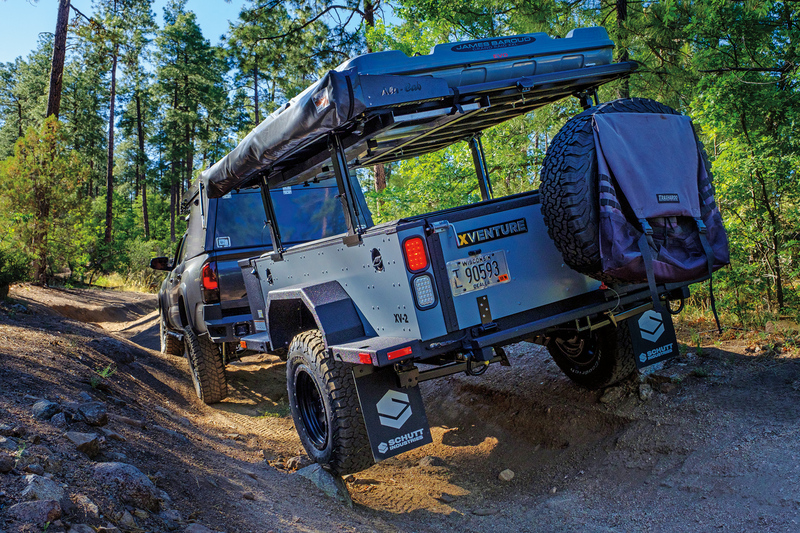 The Vintage Overland is the style winner by a wide margin, but it is a soft-roader at best and would need a more robust drawbar and suspension to survive prolonged backcountry use. Which leaves us with the Conqueror UEV-490, Off Grid Expedition, and Patriot X1; all were either awarded our Editor’s Choice Award or was the overall scoring winner of the review. But how can a trailer win the test and not receive our Editor’s Choice Award? 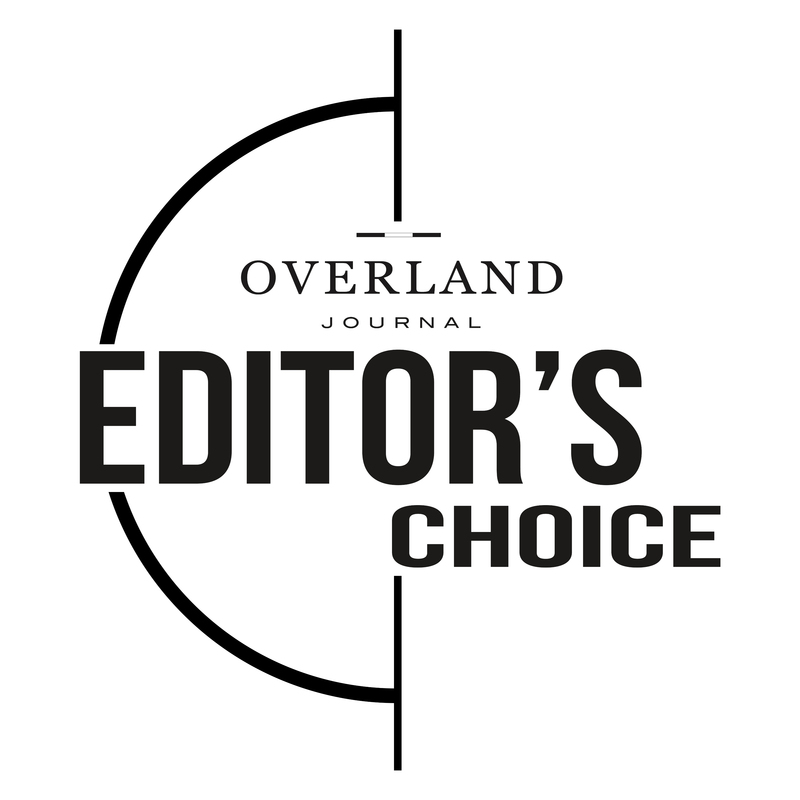 The Editor’s Choice Award has always been the product that not only scores well but is the product the editor would buy; it is their favorite solution which reflects all of their needs. In most of our tests, the objective winner is also the subjective winner, but not always. It came down to the Patriot and the Off Grid. 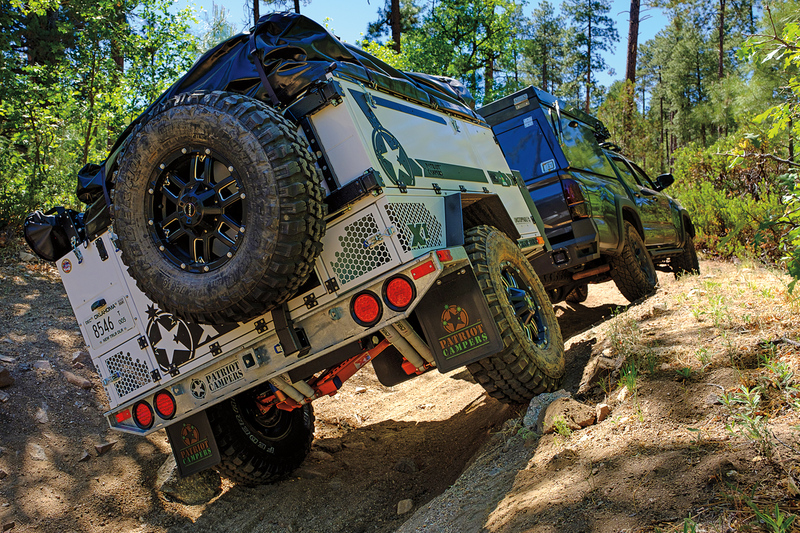 The Patriot X1 is the most refined solution of the test, with exceptional attention to detail and manufacturing quality along with the best suspension in the evaluation. The Patriot also handily won our objective testing, combining high scores in most categories and winning or tying in 4 of the 10 categories. It was the empirical champion, but it fell short in a few areas I find essential: principally, the ability to sleep inside the shell. 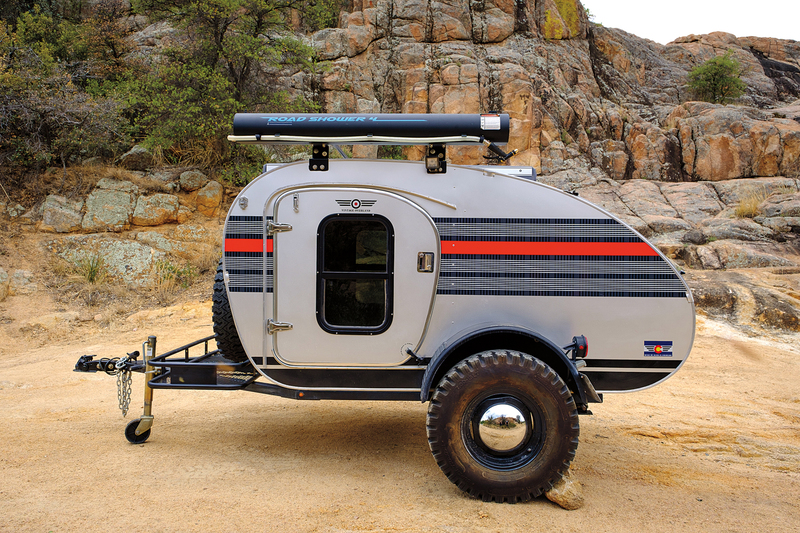 If I am going to tow a trailer, I want it to provide four season shelter and allow camping on any surface condition, even in the middle of a muddy or rocky track. Sleeping inside a hard-sided trailer provides noise isolation and insulation a tent simply cannot deliver. 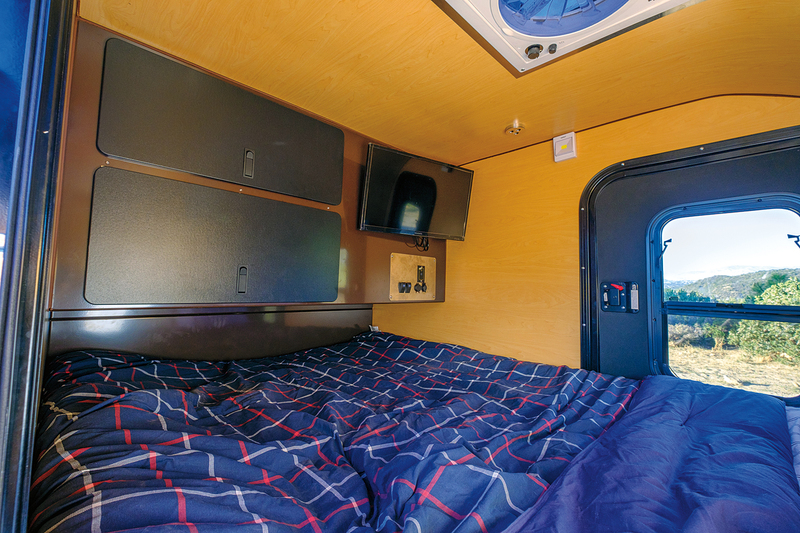 These teardrop-style units also allow for instant camp setup, as the bed is left made, and it only takes opening the door to be moments from slumber. Choosing just one of these trailers for this award was extremely difficult. I found myself attracted to so many of them, but in the end, the Conqueror UEV-490 received my vote. The suspension was shockingly good on corrugated dirt roads and embedded rocks, which is what we encounter during the bulk of our overland travels. Its road manners were excellent as well, and it didn’t feel much heavier than trailers like the XV2. I’ll be frank and say that setting up the standard awning is an abysmal experience, and deploying the front fold-out bed isn’t exactly a blast either. As someone who tends to move camp locations frequently, I don’t like to mess with anything that takes more than a minute or two to deploy, and these certainly did. I also wasn’t blown away by the fit and finish of some interior components. 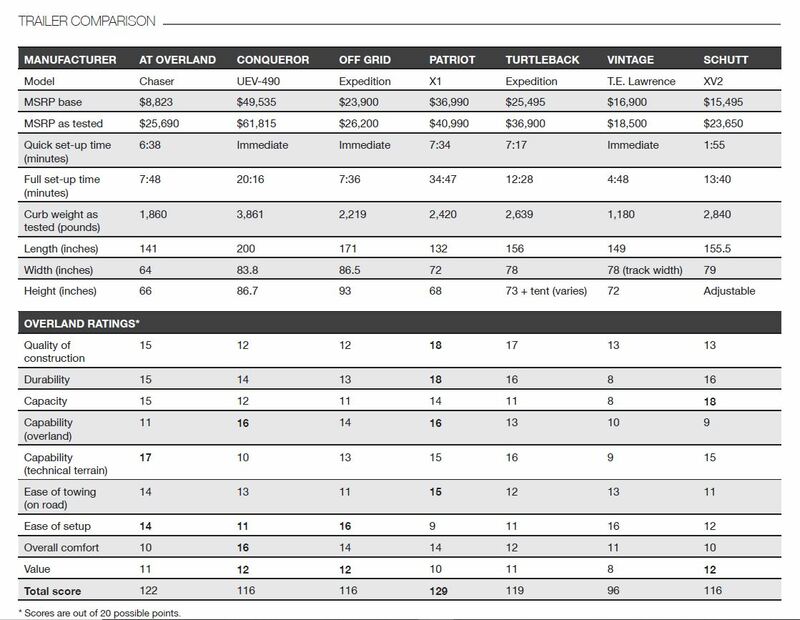 What sold me on the Conqueror? The livability. No other trailer in our test truly provides an enclosed space in which to work, move, and relax, regardless of conditions. If it’s pouring rain or snowing you can turn on the heat, sip coffee at your kitchen table, and play a board game with friends. If you find yourself driving late into the night, it’s easy to pull off at a truck stop and go to bed, no tent setup required. 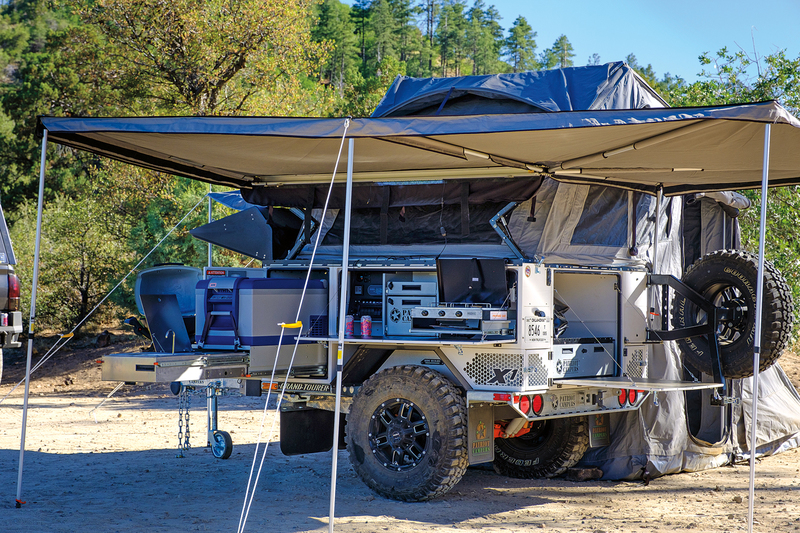 If you strip away all the showers, stereos, and kitchens, most off-pavement trailers become a cargo box and a tent, but the UEV-490 is so much more. 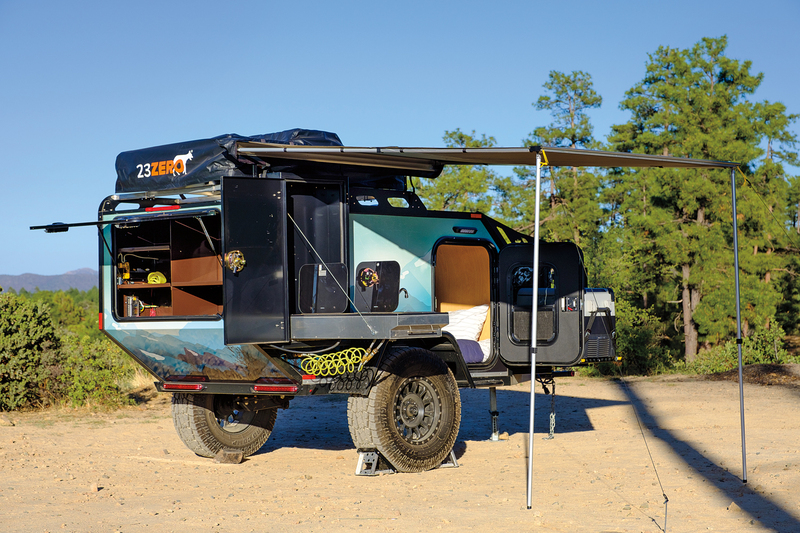 It’s a home on the road, a private oasis capable of following you to the farthest reaches of the globe, and it has proven its mettle on trails from the Americas to Africa. I can’t think of a better trailer to tow around the world than that. The goal of this Overland Trailer test was to weight objectivity and repeatability over subjectivity and personal bias. We are all biased, but in a test like this, it is the data and category assessments that allow a traveler to make the best decision. For this, Patriot’s X1 is the clear winner, combining world-class quality and durability with unmatched on-pavement and off-pavement towing performance. It also provides the widest range of camping options: a sub-10-minute base setup to a literal Taj Mahal of canvas that would sleep six. The attention to detail is overwhelming, from a mechanical parking brake to a swing-out barbecue. The suspension levels with two switches and they even provide visual leveling and ride-height indicators. The X1 exudes durability, its roots set in the remote tracks of the Australian Outback. The Patriot is the perfect choice for a family, or for travelers with smaller SUVs and a lot of gear. 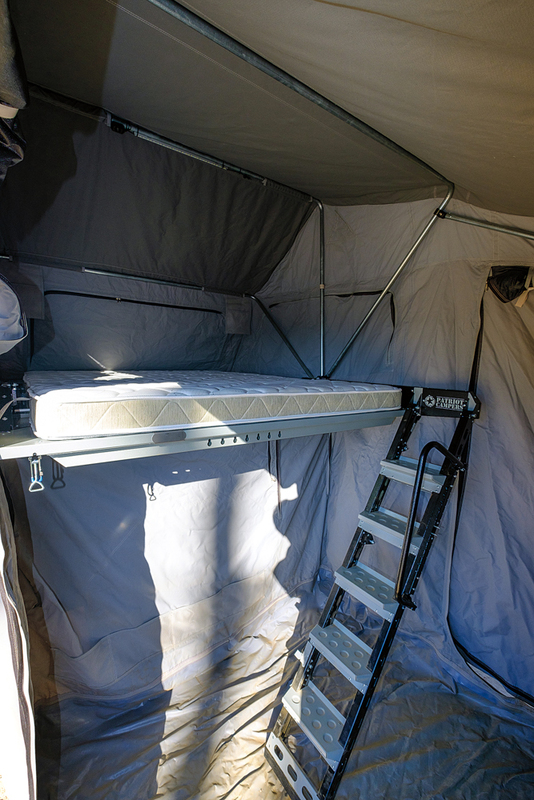 It is also the ideal basecamp in the Desert Southwest, equipped with all the comforts of home, even a ladder to the “second story” loft, complete with a spring mattress. It is the deserving champion, ready to follow your favorite adventure vehicle to points unknown.